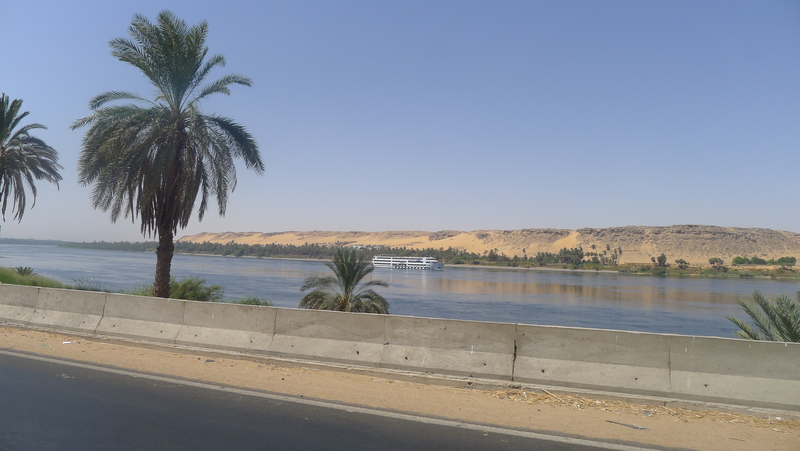 The “Night Boat” up the River Nile to Aswan was anything but luxurious, but we were very pleased that everything had gone according to plan and we were on our way to Egypt. We camped for eighteen hours on the hard deck of the ferry and our carefully chosen spot was quickly hemmed in with bodies of all shapes and sizes. 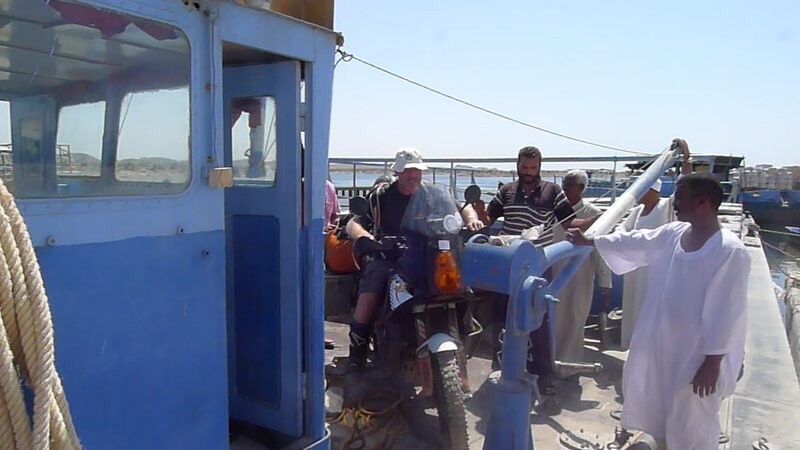 This ferry crossing from Sudan to Egypt had to be the most inefficient and ridiculous ways to cross a land border and I could only guess that some money making cartel was behind such an illogical bottleneck along a huge land border that stretched from Libya in the west to the Red Sea in the east. If one looks closely at Google Earth, as I have done on many occasions, you can see newly built roads meeting each other along the desert border all the way to the coast. I asked many people why it was impossible to use one of these roads and never got a straight answer. 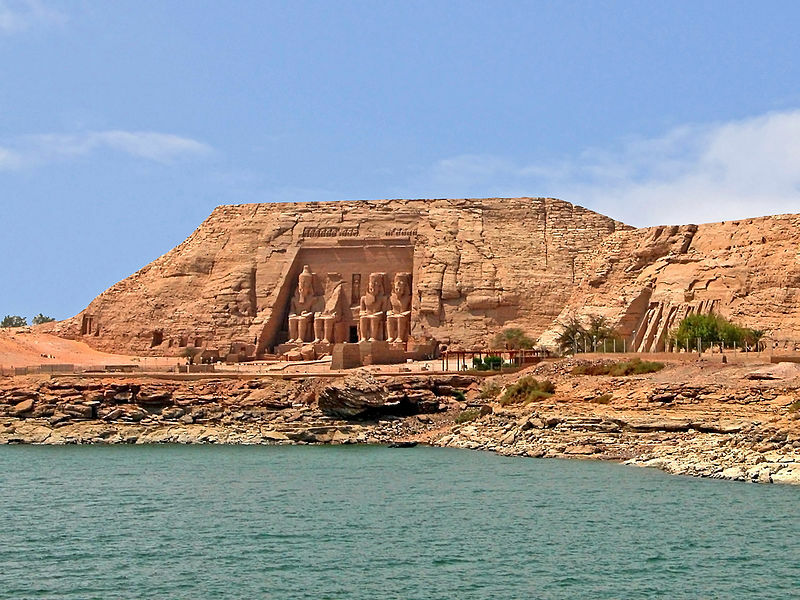 Just after entering Egypt the sun started going down and so we were unable to properly see the ancient temple of Abu Simbel which was on the left hand side of the ferry. As night settled and the sky became ablaze with stars the boat and its occupants soon settled into organised chaos and when most of the passengers weren’t kneeing down or bent over praying they were eating. The only other distraction was a very disorderly queue to get passports stamped by the on-board customs official. By late in the evening the only two people, it seemed, who hadn’t had their passports stamped were Fanny and I. Fanny because she had some funky diplomatic visa that they hadn’t seen before and thought should be left to more senior officials in Aswan to deal with, and me because I didn’t have a visa. I was a tad concerned about this but we were assured everything would be OK in the morning and so we settled back down to a hard but reasonably comfortable night under the stairs on our camping mattresses, alongside about a hundred other people. Below deck in the cabins were about another hundred and fifty people who had paid considerably more than us. I thought we had the best deal though, fresher air and a much better view. 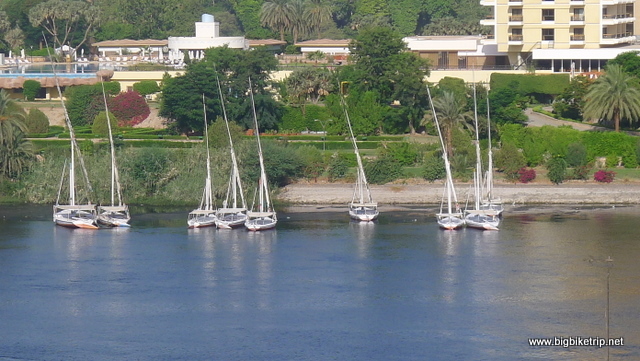 We woke at sunrise and we were impatient to get off and get going but still had a few hours to sail into Aswan. When we did see the town in the distance I was very keen to locate our motorcycles, eagerly scanning the moored barges until I spotted them. What a relief. 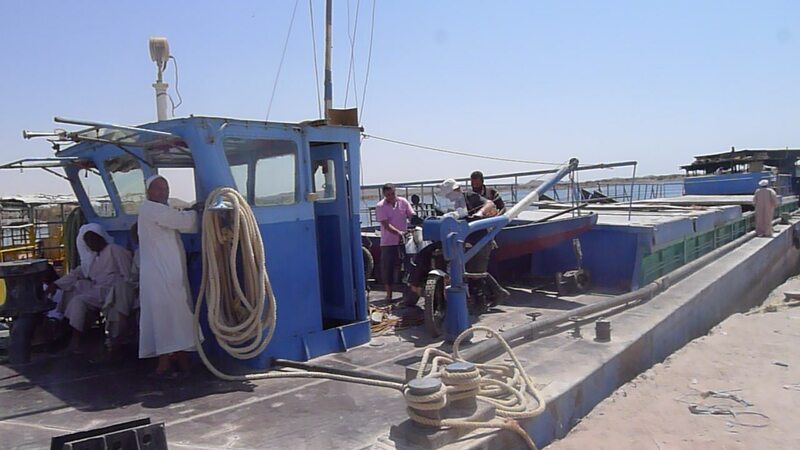 When we arrived, with of course the customary Arabic faffing about, Fanny was whisked off the boat to see a senior customs official for tea in his office and I was left on the ferry, the very last person, whilst waiting for my visa. 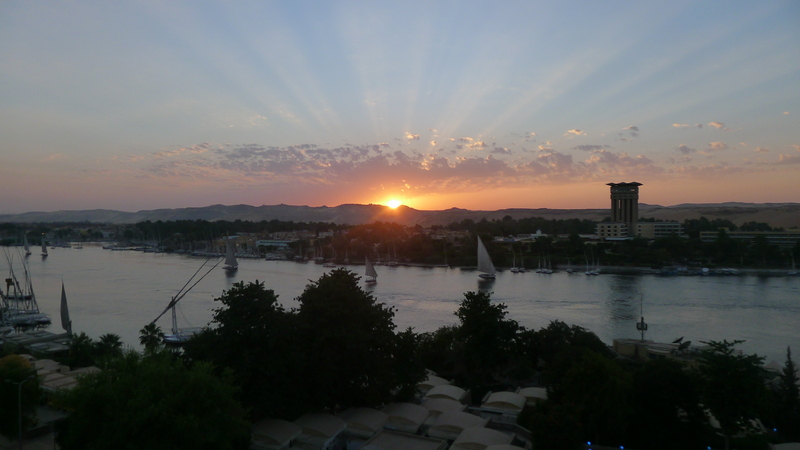 Sunset over the Nile in Aswan, Egypt. 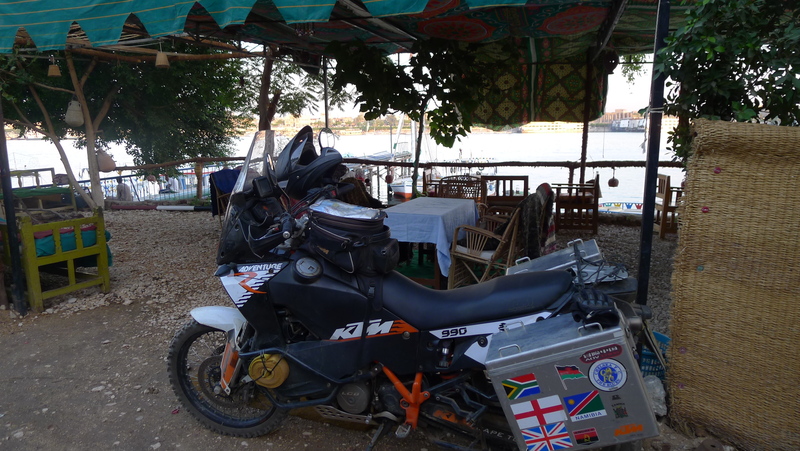 I have spotted our KTMs on the deck of the barge moored up at Aswan port.. what a relief. Keeping my eye on the bikes and now wondering how I will get them off and what hassles lay ahead with the authorities. Thinking about riding them off the barge onto the jetty, but not doable so in the end five of us literally lifted each bike up and carried it off .. with all the kit and full panniers..
Now my bike.. They both had to be carried because there was a big metal blue post in the way. 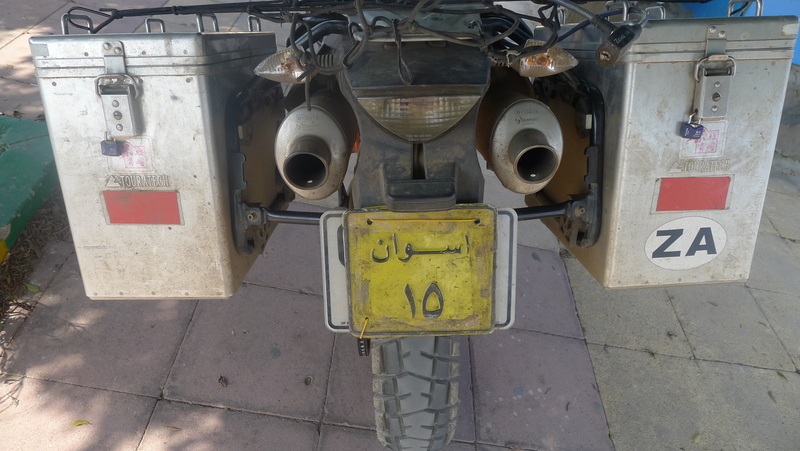 After clearing customs and immigration our bikes are fitted with Egyptian plates.. Aswan 15 for me and Aswan 3 for Fanny … Looks like 10, but Arabic numerals have a zero looking character for 5. Eventually I was given an official looking shiny sticker in exchange for eleven Egyptian pounds and told to affix this visa onto a blank page in my passport. Some Arabic was scribbled over the top allegedly specifying I had a month of stay. As all this was happening I watched with amusement as fifty or so people with bags, boxes and other cargo tried to squeeze through the exit door at the same time and they were not giving in to anyone, a scene reminiscent of old Cantonese crones elbowing their way onto the mass transit railway in Hong Kong. Amongst goats and dodgy looking piles of cargo piled up on the dock I had to find and employ a local agent to help me negotiate getting our bikes off the barge which was moored inaccessibly between other barges a couple of hundred meters away, and later help us through the inevitable inefficiencies of Egyptian customs. There was no other way. Two hours later, after paying a small fee to every man and his dog to move the barge to a more suitable location, I had to manually lift the bikes off the barge with help from a couple of hired hands as they weighed more than 280 kilograms each. Whilst the fee I paid them was not a lot, I thought the amount of time being wasted was far too long. These people could get a PhD in faffing about and squabbling. Freddie Golbourne (my grandfather who happened to be in north Africa in the early forties) told me about his Egyptian colleagues when I was a small boy. Seems things hadn’t changed. 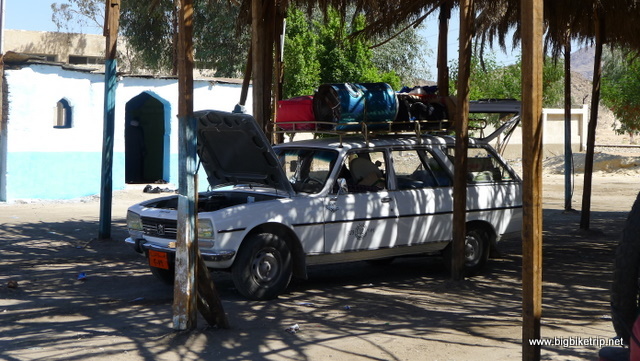 I was told, however, that I was lucky as it was not uncommon for foreign vehicles to be held hostage for days, weeks, or as we would later see in the Egyptian custom department’s impounded vehicle “grave yards”, indefinitely. The penny had dropped. Now I knew why Egypt demanded ridiculously high deposits for the Carne de Passages— its a huge scam. 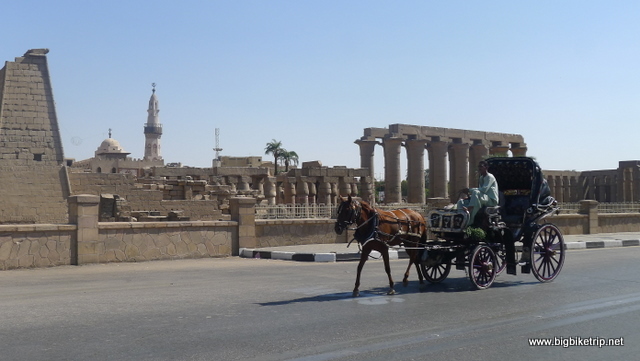 For slight infractions of the ridiculous Egyptian red tape vehicles were confiscated for un-affordable ransoms and later sold at “fixed” auctions where the spoils were shared among the corrupt officials. My suspicions were confirmed when I saw all the expensive foreign cars and trucks covered in dust at Cairo airport in the foreign vehicle “graveyard of misery”. Suitably imbued with charm and supplied with cigars and soft drinks my newly acquired friends in the customs department later told me exactly how the scam operated and how they shared the spoils, and by the way,would I like some Hasish? Some people, huh? With both KTMs now on the slipway and Fanny still being entertained by the head shed at immigration, probably fretting she was President Hu’s daughter or something, I checked over both KTMs and they were in perfect order. No worries at all. 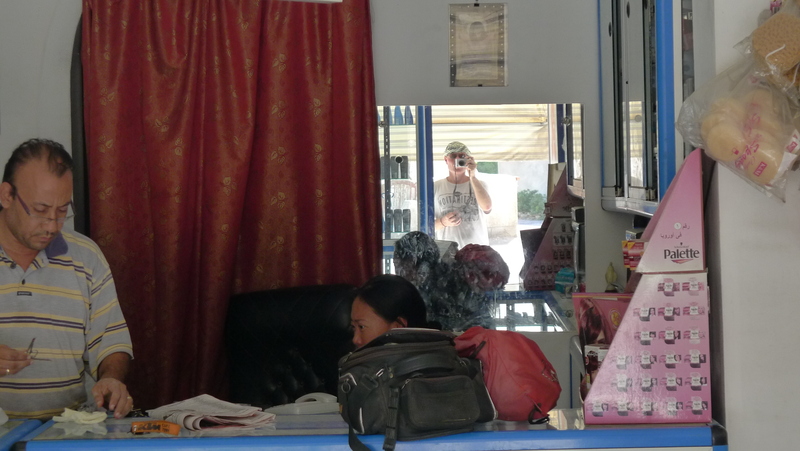 My recently hired local agent told me there was still more fun to enjoy and so my day out with Egyptian customs and immigration was to continue for another three hours or so, with a subtle threat that if I make any fuss whatsoever they will make it two days, or even three. And so, I filled out more forms, signed Arabic documents that could have been confessions to drug trafficking for all we knew, photocopied more documents, handed over more cash and in return got a wad of paper and two sets of Egyptian motorcycle number plates to affix over the South African ones. 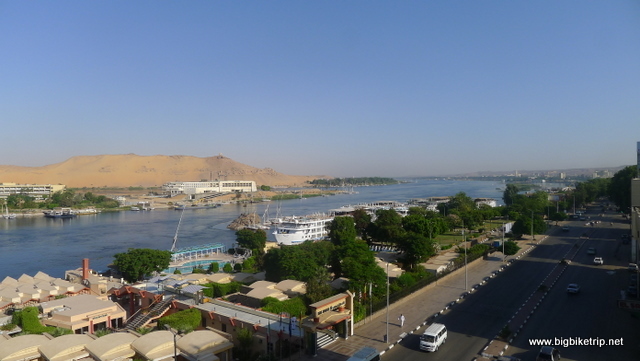 Aswan 3 for Fanny and Aswan 15 for me. Whilst we were waiting around next to some bored teenage soldiers with heavy weaponry, Fanny mastered how to read and write the Arabic numerals, and I concentrated on trying to be a good boy, smiling sweetly and keeping my mouth close. Its always tea time in Egypt. Love it. 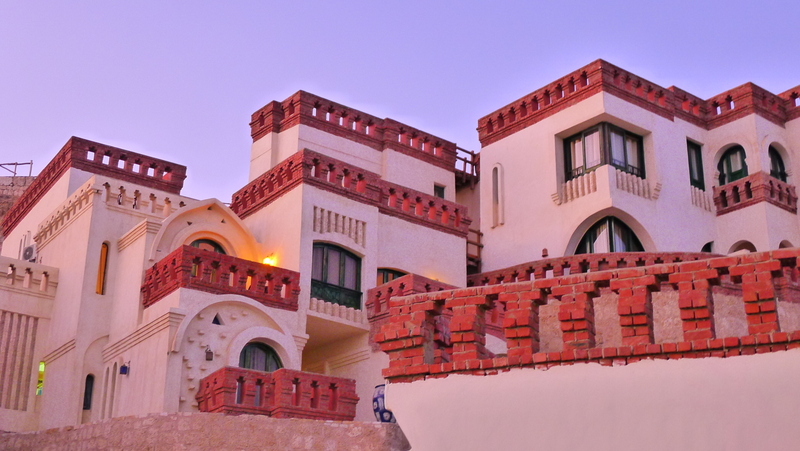 Outside our hotel, The Hathor in Aswan.. a very reasonably priced and very decent hotel. 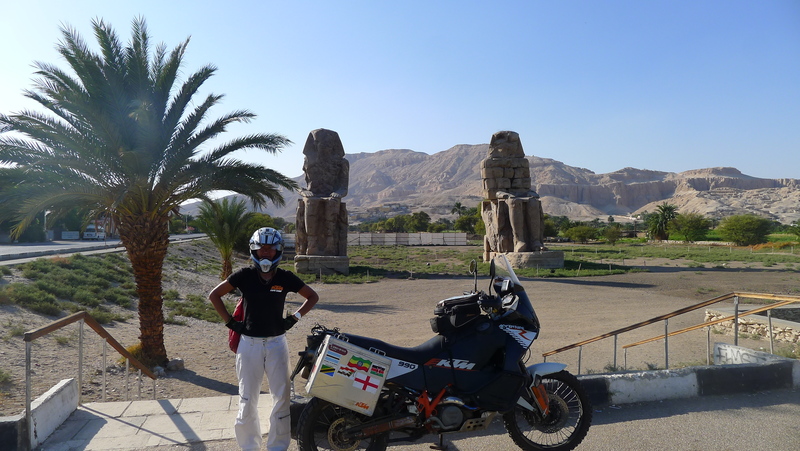 Fanny posing against the ancient statues in Luxor with the Valley of the Kings in the background. 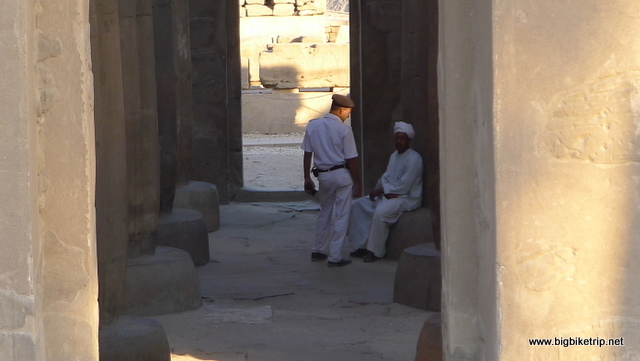 Lots of touts in Luxor … all good natured banter, but wasting their time with us. We had arrived at the port in the early morning and we managed to escape by late afternoon. 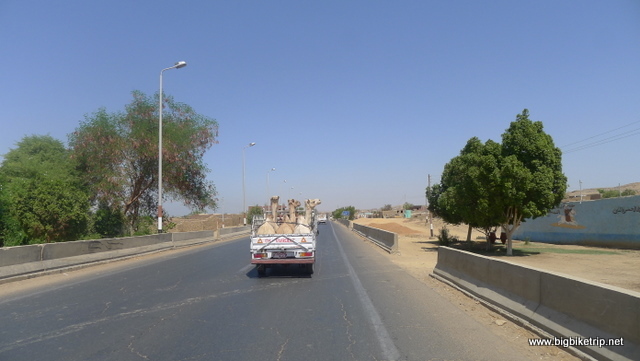 As we left the customs area we were immediately stopped at a heavily armed police roadblock, one of literally hundreds we got stopped at during our stay in Egypt. Some were literally just a few hundred meters apart and it took considerable restraint not to point this out as the authorities re-checked our passports and driving licences again and again and again. This encounter was reasonably common, although using my “I used to be a policeman” trump card and of course the language barrier prevented us actually handing over the prerequisite fifty pounds that many of the local Egyptians, expatriates and fellow travelers had to part company with all too often. Fanny maintained that I am a scary mad bugger and that most people are just happy to see the back of me. Well that’s a good thing. All noses cut off statues .. why? 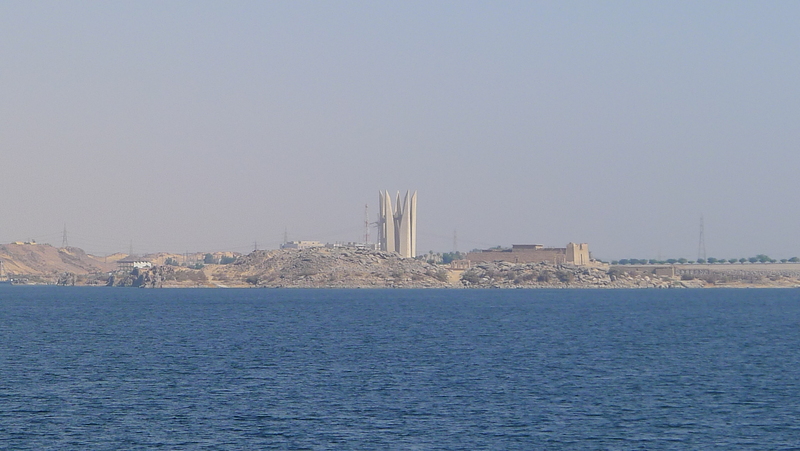 We rode past armoured personnel carriers, tanks, dozens of soldiers on every corner and crossed over the heavily guarded Aswan Dam and into town which was very touristy, with Nile cruise ships moored end to end along the banks of the river. And then I saw them, glowing down at us, the golden arches… Ah!… McFul. Yum. 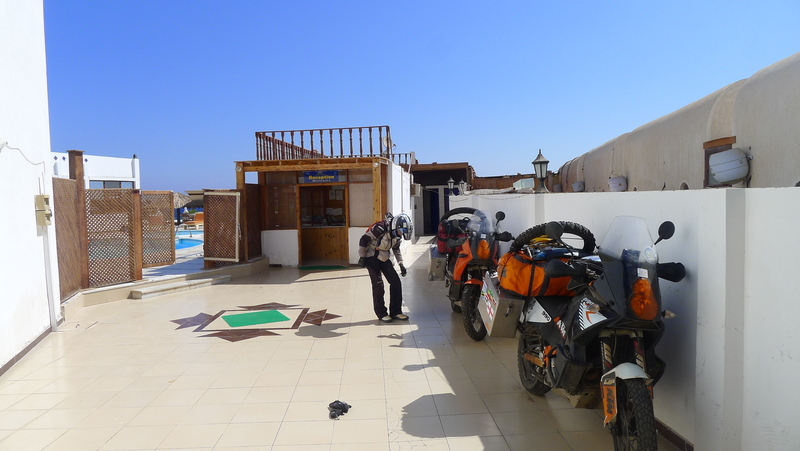 Some Germans we met in the desert in Sudan recommended an excellent hotel right in the middle of Aswan and we found it easily enough and managed to park our motorcycles safely around the back and were given a very decent room at a great rate. The tourist industry was still reeling from the Spring revolution, the economic downturn and the repercussions of blowing tourists up with fire-bombs and so good deals were to be had, but on the negative side the touts in Aswan, and especially Luxor were swarming like flies and descended upon us whenever we stopped and were relentless in whatever pitch they were pitching. 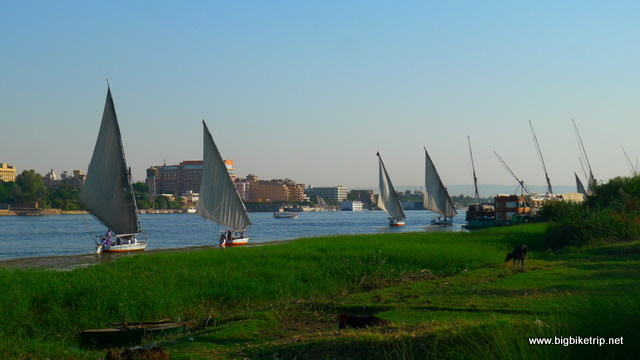 Felucca rides across the Nile and horse and cart rides through town being the most common. We even got asked if we want a taxi whilst sitting on our bikes. That’s desperate or dumb. This was the first time for a while we saw, how do I put it, “common people”. Most of the tourists we had seen so far were the adventurous interesting types and people who get off the beaten track and read the travel sections of the colour supplements in the broadsheets. Here in Egypt there were the sort of tourists who were too old to go to Ibeefaa, too fat to get on the rides at Alton Towers and were too slow booking themselves and the kids, Chesney and Tracy into Butlins at Skeggy. You know, Man United Torremolinos Watneys Red Barrel chip eaters with annoying regional accents. A snob?, I sincerely hope so, but mainly I just don’t like them or their vulgar ways– and don’t want the touts to keep bugging me as if my first name was Wayne. 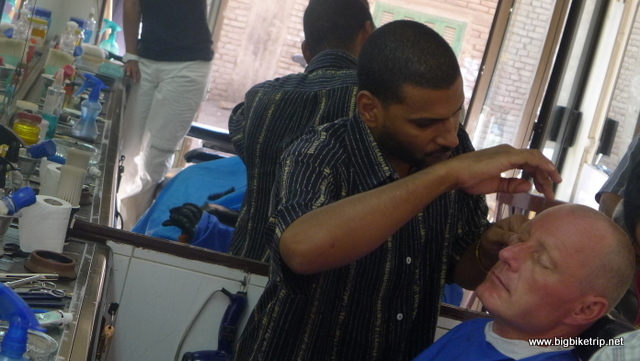 Aswan, as well as having the American fast food chains, also had an HSBC bank and their cash points to completely empty my account, ice cream parlours, chip shops, a bazaar selling mostly Chinese tack, mosques on every street corner and a Catholic church. The latter, we enjoyed visiting, but I spared my heathen travel companion from having to attend a full Mass. 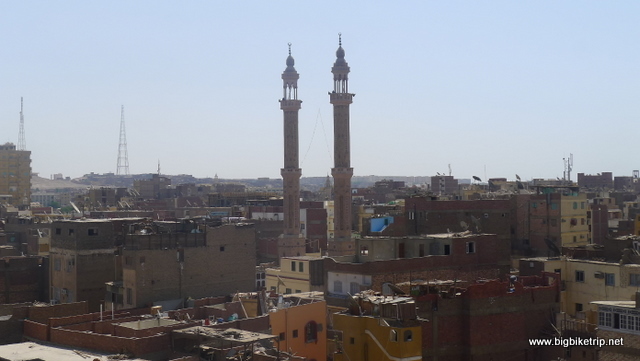 Aswan was also the location where extremist Muslims burnt down a Coptic Christian church, sparking a huge demonstration in Cairo that resulted in 30+ deaths. 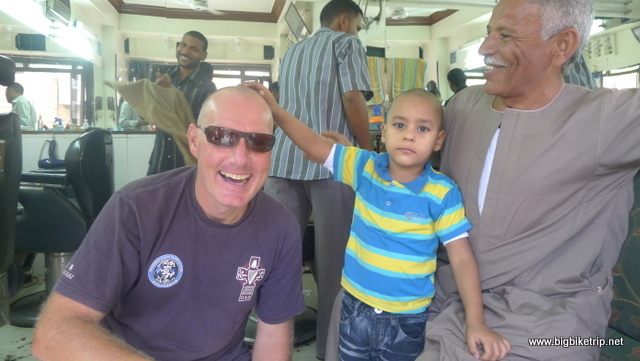 I even went for a haircut and my attempts to ask for a little off the sides were lost in translation, and for the first time in my life (as I was born with a long barnet) I had a completely shaven head. It was very comfortable but did look more William Hague, than Jean Luc Picard. Most importantly there was 95 Octane petrol in Egypt and it was as cheap as chips, less than 8% of the price that people in the UK have to pay at their pumps. Since all oil actually costs the same for a barrel the variance between countries is due to the tax that governments levy so that revenues can be raised, for instance, to fund aid payments to Africa where a lot of oil comes from in the first place. What a strange world we live in. 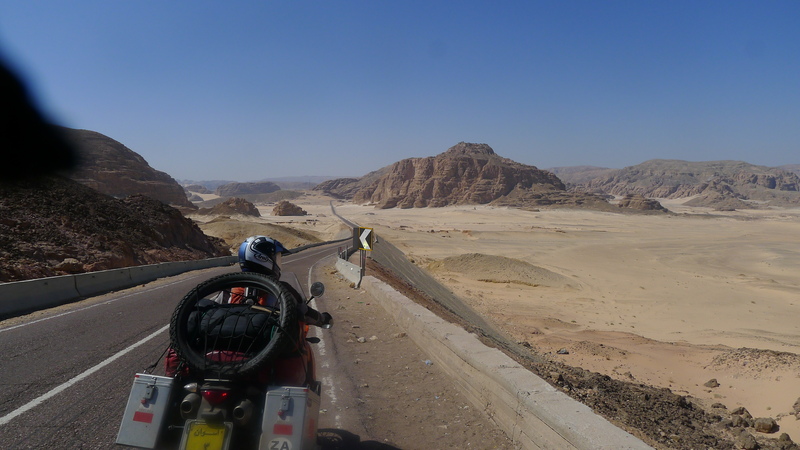 Crazy politics and economics aside, it meant we could ride our motorcycles cheaply throughout Egypt, and we would, putting thousands of kilometers on the clocks as we zigzagged across the country and back and forth across the Sinai peninsular, a particularly stunning and interesting part of the world. 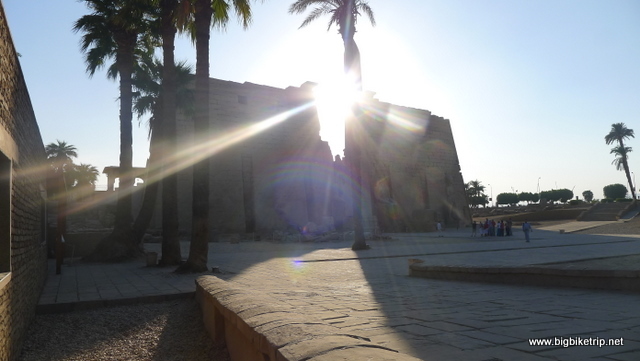 But our next stop was Luxor, arguably Egypt’s most important city historically and so we followed the Nile northwards along rather shabby roads, and in a high state of alert as Egypt may very well have the world’s worst drivers. They are absolute shockers, worse even than those in China or India. We both found the atrocious driving standard very stressful and very annoying. 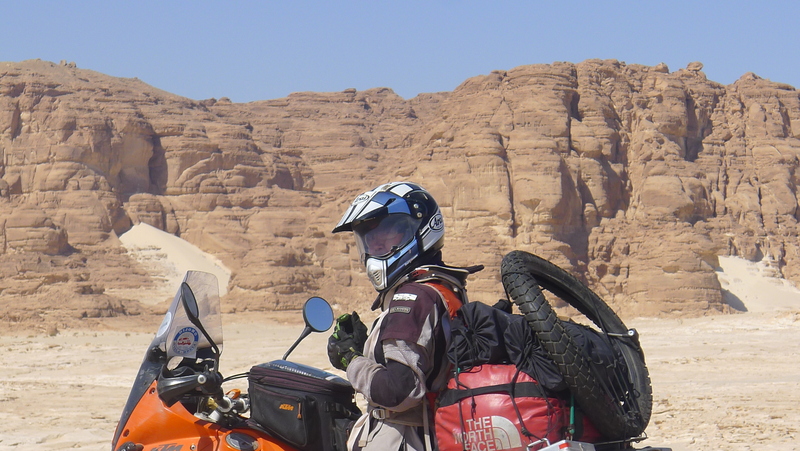 Still taking in the sites … a motorcycle is definitely the way to do it and avoid the touts and go where you feel like. Maybe the ubiquitous old Peugeot cars are to blame for the poor driving, but most likely its because everyone is too busy shouting into their mobile phones as they drive along. I even saw a taxi mount a curb as the driver attempted to tackle a roundabout with one arm twisted on the wheel and the other stubbornly clutching the telephone to his ear. Rather than putting the mobile phone down to use both arms to control the car he preferred to continue talking and veer off and into some pedestrians on a footpath. Every car we saw, whether new or old, is covered in scrapes. White lines, it seemed, are for aiming along rather than delineating lanes to drive in, and vehicles always swing left before turning right and visa versa. Unexpected U-turns, stopping in the fast lane, speeding, drifting, macho acceleration, erratic maneuvers, double and triple overtakes, and a complete disregard for other road users is common place. There were even young children recklessly driving old Fiats and Peugeots with their foot constantly buried into the accelerator and their hand glued to the horn. Often vehicles would draw up along side our bikes while we were nervously riding with inches to spare and the driver and occupants would just grin at us like idiots and ask questions that we couldn’t hear in our helmets. And the worst for a motorcycle, being converged on from the left and the right at the same time causing nerve-wracking evasive action to prevent a collision. And yes… our headlights are always on… no need for everyone to keep telling us by waving and miming to us to turn them off. We call it a safety precaution in developed countries so that motorcycles can be seen. The motorcycles were parked under our balcony in the street and apart from the occasional kid who would sit on them, or use them as a background to take pictures, they were safe and secure. I also got a chance to do some routine maintenance in peace such as chain adjusting and oiling. The bikes were absolutely fine. Nothing wrong with them, although the front off road M/T 21 tyres really needed changing back to the 50/50 Pirelli Scorpion M/T 90s, which I would do later. 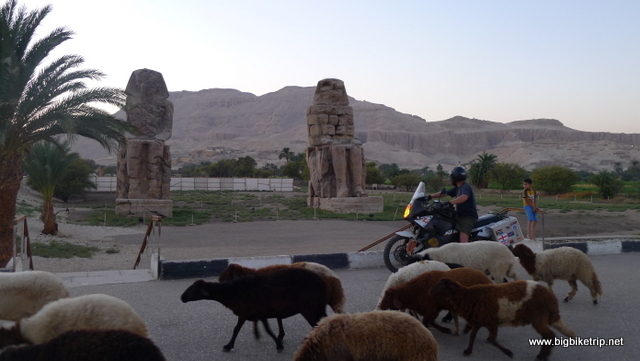 We took the Adventure R (my one) and Fanny rode pillion as we explored the sites of Luxor, museums, temples, and over to the west side of the Nile to explore the Valley of the Kings. Again we paid for nothing as we rode around famous statues and monuments, occasionally chased off by security people who would make some half hearted effort to catch us. The only tourist site we actually paid for in Egypt was entry into the Egyptian museum in Cairo which was absolutely awesome. I would like to know why all the statues have their noses missing. Theories include Alexander the Great defacing them, the style of sculpting and conspiracies against black Africans (yawn). A prize of a mystical healing crystal pyramid to the person with the best answer in our comments. 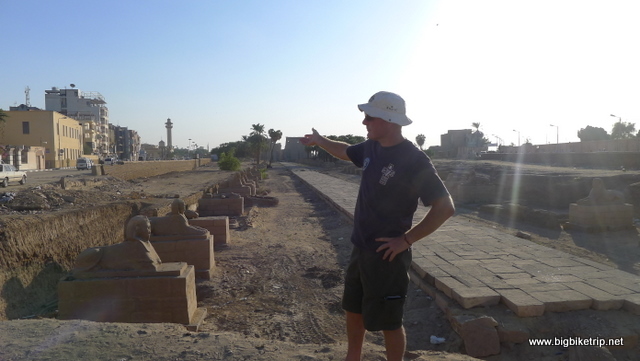 After a few days of playing the tourist we were getting a bit bored and I had been pouring over the maps wondering whether to follow the Nile to Cairo or head east to the Red Sea. ‘Where to then, Fanbelt?’ I asked. 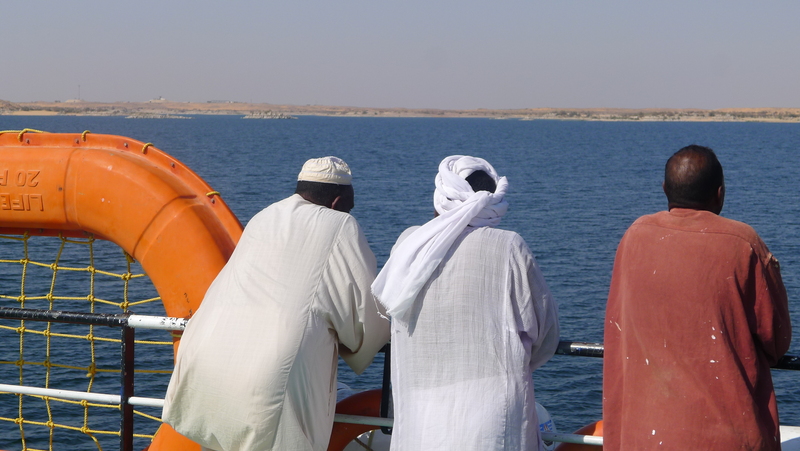 Red Sea was the reply and so we turned right at Qena and very soon left the greenery of the Nile and back into the desert… our destination Al Hurghada. 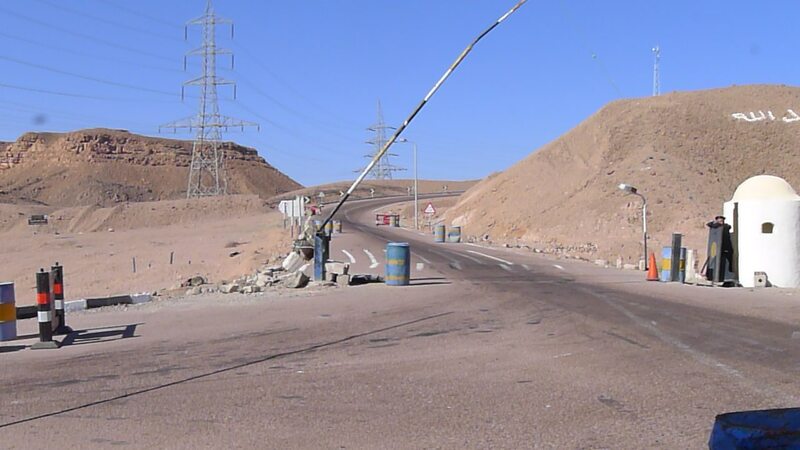 Typical stretch of Egyptian highway.. not that busy here… but around Cairo and the north very hectic. Never Eat Shredded Wheat .. sun sets in west so must be heading north (ish). As we approached the coast we descended through some spectacular mountains and then we saw the sea, an amazing turquoise blue that stretched from north to south as far as the eye could see. 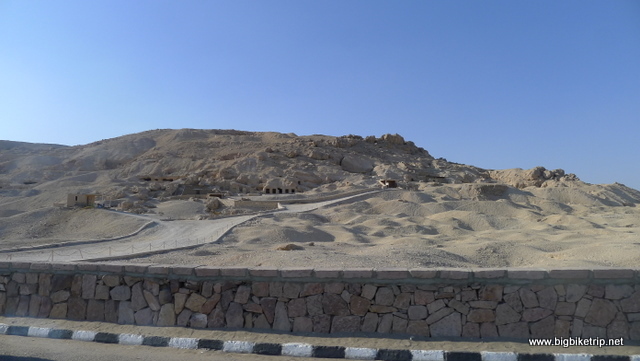 The town of Al Hurghada was stretched along the coast and as we got nearer it looked like a construction site, or perhaps, as I suspected, an ambitious tourist industry project that ran out of funds. There were miles and miles of unfinished hotels and resorts, concrete skeletons stark against the azure of the water. There were also high end tourist coaches, with curious occupants, mostly European peering down and pointing at us as we roared passed them on the bikes. I presume they had been picked up at the airport and were being ferried to their resorts. Their journey being considerably shorter than our own. 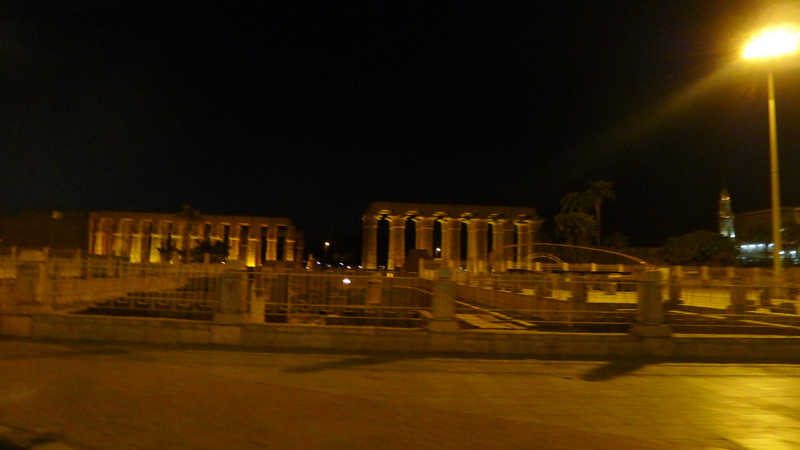 We continued following the signs to the centre of town and it was even more touristy than Luxor or Aswan. Hurghada was a location one sees posted on the windows of UK high street travel agents, except it became obvious that it was probably advertised much more in Moscow or St.Petersberg. There were Russian signs everywhere and we were to see many Russian shot-put figured women and some more svelte like glamour models with their James Bond baddie boyfriends. 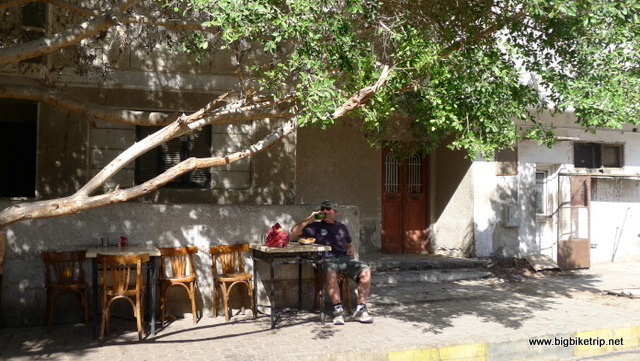 We stopped off at a roadside cafe in the bustling high street and had a late lunch and thought about what to do next. Finding a place to stay seemed logical and Fanny used the free WiFi which was everywhere to research budget hotels and we found the perfect one. The Sea View Hotel http://www.seaviewhotel.com.eg/ in the old town area and when we found it we booked into a very clean and simple room. 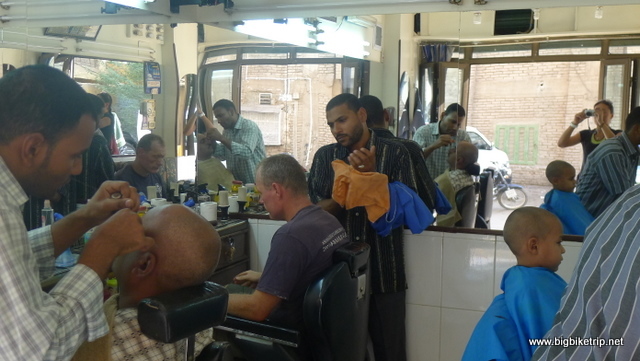 In fact all the Egyptian budget places were superb when compared with those we had seen in Ethiopia or Sudan. 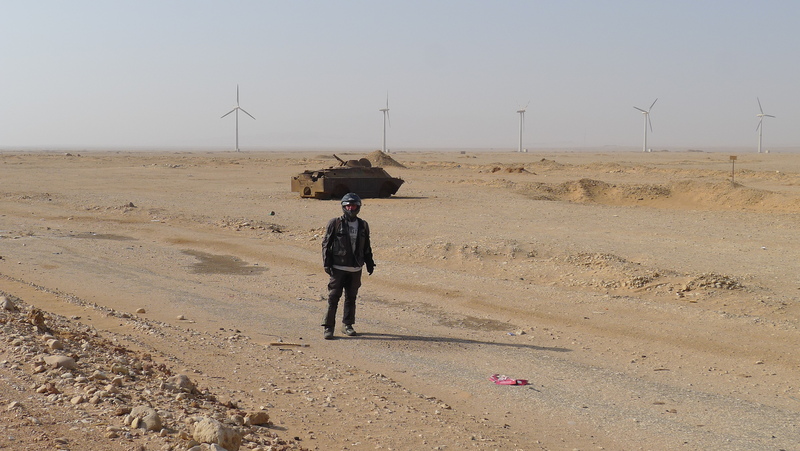 I would have much preferred to camp, but in this part of north Africa it seemed this wasn’t a common option. At the request of the hotel owner, our bikes were parked outside on the pavement next to the entrance, much like Chinese mansion gate lions. The owner was a larger than life character with mannerisms and an accent that reminded me of one of the Greek or Egyptian entrepreneur types characatured so well by Matt Lucas and David Walliams in their comedy sketches. He did run a very good place and had very friendly and helpful staff, especially the manager. Sea View was a good choice. 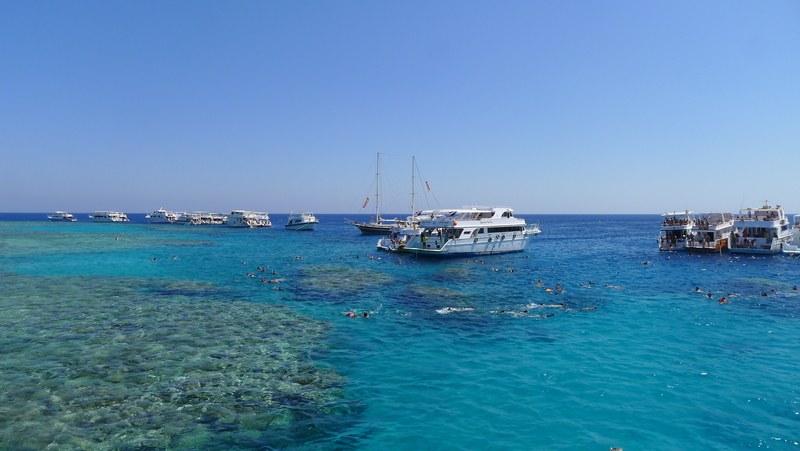 We were persuaded to book a whole days snorkeling on a cruise boat for a total of ten Euros each and so I was not expecting much, but we were taken by a very competent crew, on a top quality diving boat to several of the best reefs in the area. 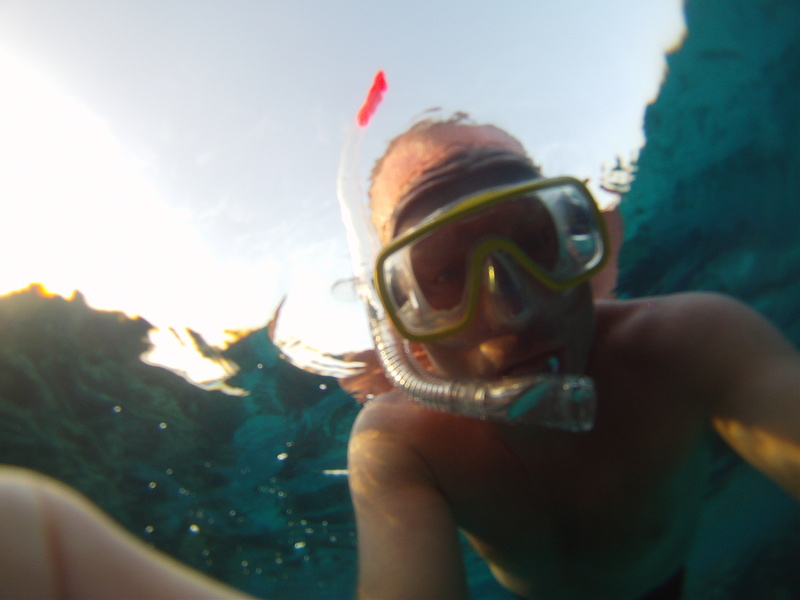 This included the snorkeling equipment, a water guide, lunch and at the end of the day an impromptu party and dancing. I actually hate organised trips of any kind and especially boat trips. In Hong Kong people would often hire a junk and spend the day cruising the islands around the territory, swimming, partying and drinking beer…finishing off the day with a seafood dinner at one of the restaurants on Lamma Island, Cheung Chau or Lantau. Whilst this may sound a great way to spend a weekend for many, I hated such trips and used to count down the seconds until I could get off the boat and go paragliding in Sek O, go running, or ride my motorbike. In the Royal Hong Kong police we would have a day off each year to take our respective teams or units that we commanded on the “Annual Launch Picnic” that involved taking the team off on a boat to some government facility on an island where the team would play Mahjong, drink beer and eat strange things incinerated on a barbecue. I enjoyed the company of my colleagues and especially seeing them enjoying themselves. It was good for morale, team spirit and esprit de corp, but I secretly hated every minute and longed to be back on the streets and back alleys with triads, bank robbers and investment bankers. Its a strange thing I know, but I really do not like boat trips. Fortunately on this boat trip it did not last long before we got to the snorkeling sites which were superb. 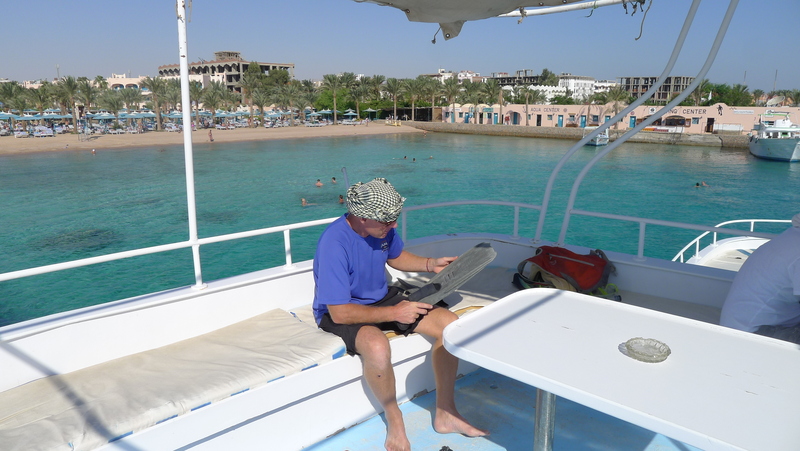 I hadn’t been to the Red Sea before and I have to say it was one of the best places in the world to scuba dive, snorkel or just wallow about in the sea. Most importantly, Fanny was enjoying herself and that made up for everything. 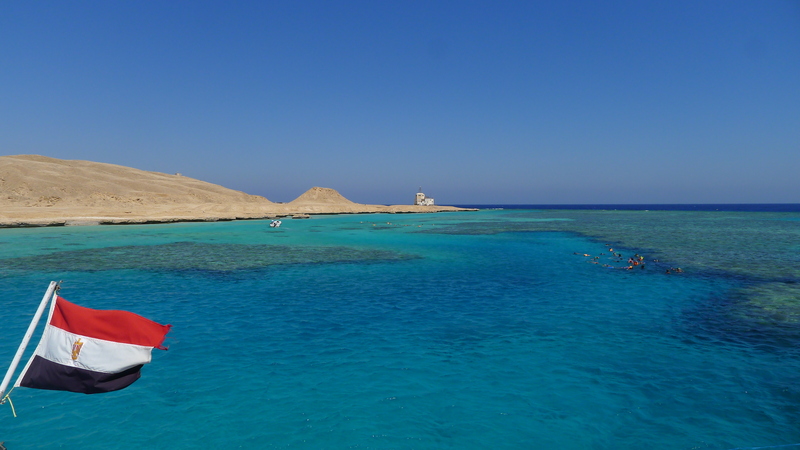 Fanny and I going on a day trip snorkeling in the Red Sea near Hurghada… stunning water and amazing marine life and coral. 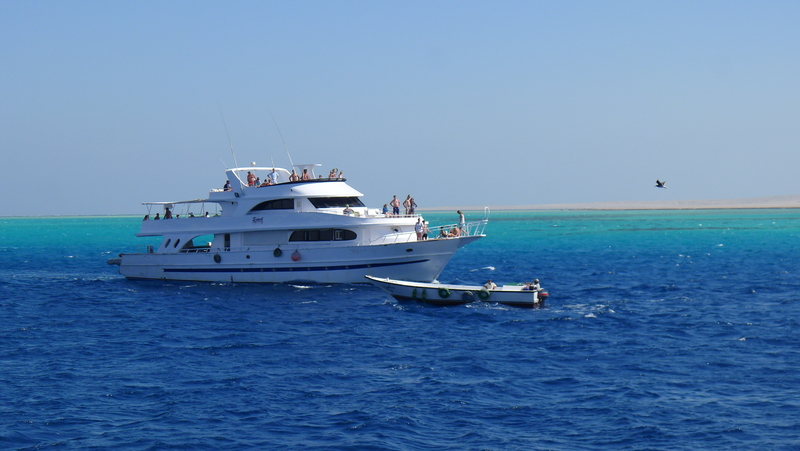 A very reasonably priced snorkeling trip to some beautiful reefs and coral islands. Lots of other diving boats doing the same thing. 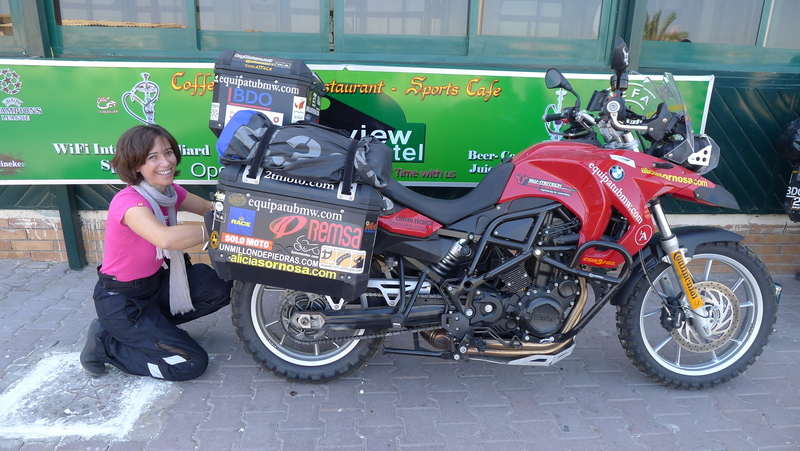 Alicia’s BMW GS800…..not much ground clearance for those rocks later on in north Kenya…!! Saying farewell to Alicia and Miquel who were heading off south on their loaded up BMWs. 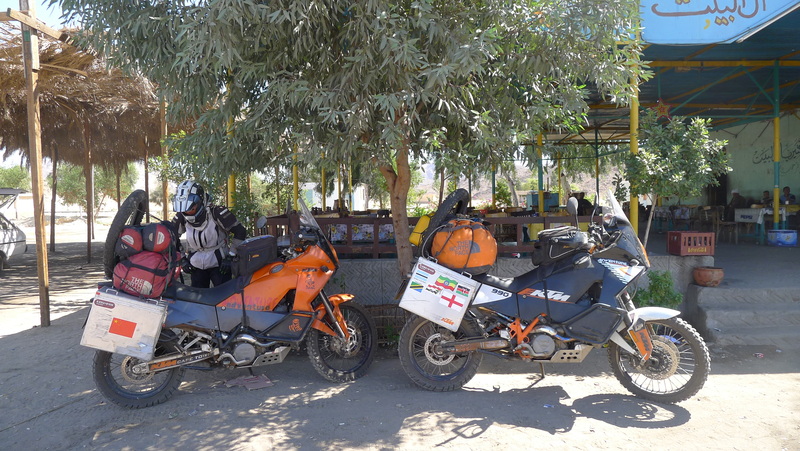 They were two of a few globe trotting adventure bikers we met on our own big bike trip. 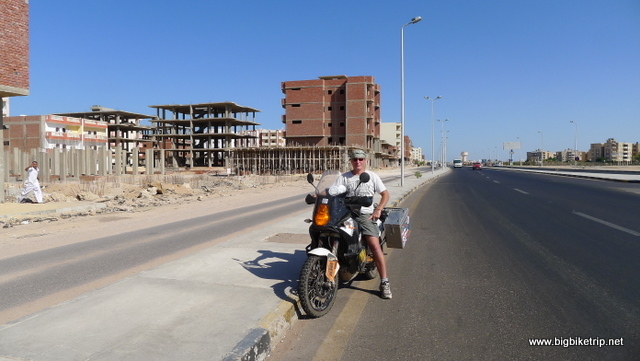 Fanny and I riding about exploring the area on my R … there were lots of unfinished hotel and holiday complexes throughout Egypt and some resorts had more unfinished projects than competed ones. Whilst on the boat I saw my first Egyptian “duck“, not the feathered kind but the gigolo type. This particular chap had got charming middle aged and rather unattractive ladies down to a fine art and on this occasion he was with an exceedingly “plain” looking middle aged British woman. I guess it was the opposite way around to the western old farts one sees in Thailand, the Philippines etc…with their young female chickens. I have nothing against this entrepreneurial activity at all, provided consent is mutual and age is appropriate, and on this particular occasion his lady seemed to be having the time of her life, being given all the affection and attention any women could possibly want and probably hadn’t had in a long time. 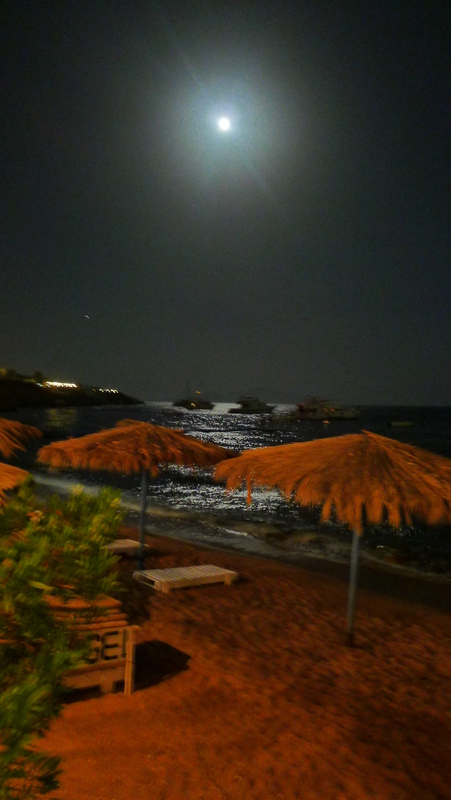 I guess its not only the sun that makes a perfect holiday. 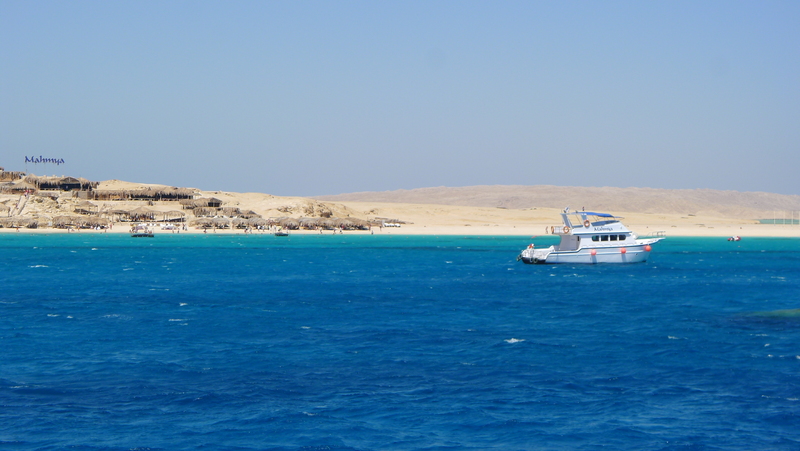 Whilst we were in Hurghada we tried to get a ferry across to Sharm El Sheikh which is on the southern tip of the Sinai peninsular and apparently much better than Hurghada in terms of beauty and marine life. 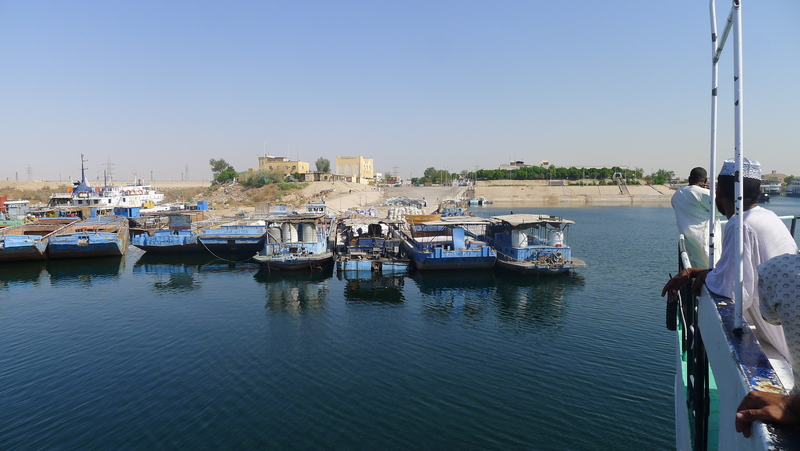 However, despite the distance being less than 20 kilometers, all the ferries had been cancelled and the only way was to ride over a thousand kilometers all the way to Suez, go underneath the canal and then back down south again to Sharm El Sheikh. 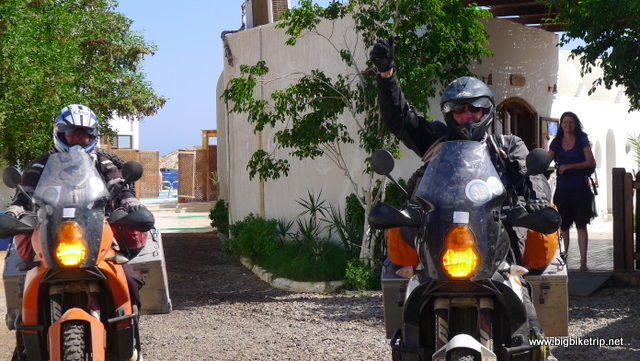 So that is what we planned to do in a few days time, and in the meantime we would explore Al Hurghada on our bikes and enjoy the many wonderful seafood restaurants and tea houses. 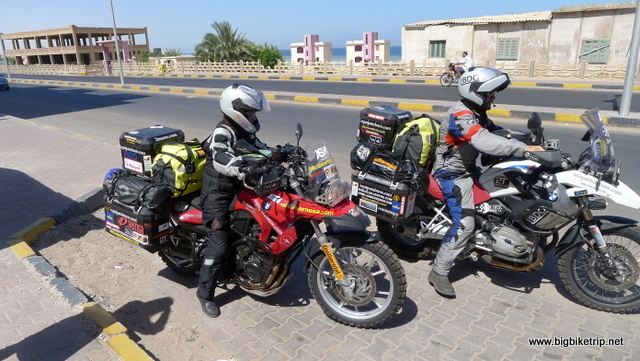 Whilst riding back to our hotel, no helmet, wearing the classic motorcycling attire of shorts, flip flops and an Arabic headscarf, I saw two BMW adventure bikes, all kitted out with the latest accessories by the side of the road. I stopped and introduced myself to the two riders, Alicia and Miquel, two Spanish riders who had just arrived from Italy and were looking for a place to stay. The hotel they were looking at was over three hundred pounds a night and I recommended our hotel, which was less than a quarter of that price and so they followed me back and booked in. It was great to meet them and a very welcome opportunity to chat with fellow bikers and swap notes. Miquel told me they were riding around the world and following the routes of Spanish explorers over the ages. After being educated where most of these places actually were it seemed that they were embarking on an adventure of considerable note. It was a well planned expedition, perhaps better than our own and certainly better financed as they had secured sponsorship from many different motorcycle and accessory companies, and a major deal with the accounting firm, BDO. Of course they were riding BMWs, an enormously successful automotive company that has a global network and very a well oiled marketing strategy. 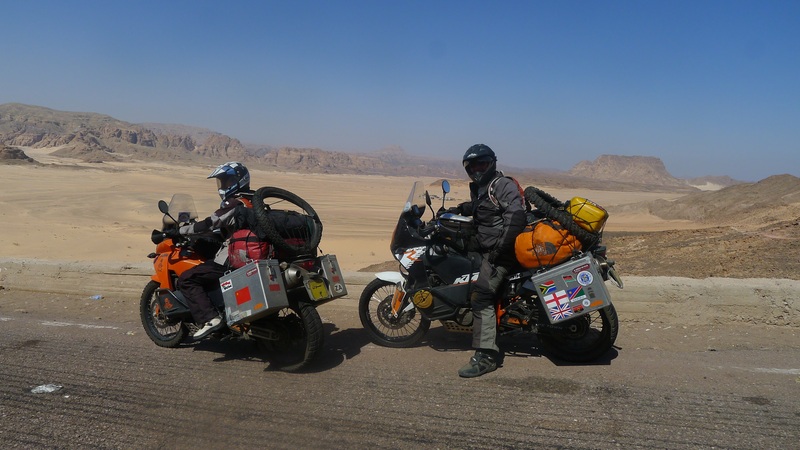 BMW motorcycles were reaping the rewards of successful campaigns like the “Long Way Down”, “Long Way Round” and “Race to Dakar” TV series and also the adventures of real riders like Miquel and Alicia. Through their adventures mere mortals could live vicariously and emulate their lifestyle by owning a BMW adventure motorcycle and of course other accessories such as enduro jackets, trousers, boots and helmets. I actually think BMW make quite good bikes. I wouldn’t mind a GS 1200/800 Adventure or an S1000RR myself… I would also like a Yamaha XT 660/ 600/500, a Triumph XC 800, a Ducati Multistrada 1200, a CF Moto 700 Adventure and a classic Honda Africa Twin 750. I like all motorcycles and have owned many different types of the yars. However for what we were doing I really think our KTM motorcycles are the very best on the market and are designed and engineered to go anywhere and ride on any surface. Real tough globe trotters. Alas, KTM are not that great at marketing nor very interested in people like Fanny or myself. Unless you are going to win the Dakar or a Rallye Raid in the Atacama desert KTM will not sign you up for sponsorship or assist in anyway. Maybe with the release of the new KTM 1190 Adventure they may be able to haul in BMWs dominance of the market, but I suspect without a shift in their marketing strategy and an improvement in their global after sales support it will be unlikely…. sadly. Poor Fanny having an in growing toe nail removed by a local doctor …. Ouch! One of hundreds of police and army road blocks we had to ride through. For many of us from the west we take for granted our freedom to go where we like. 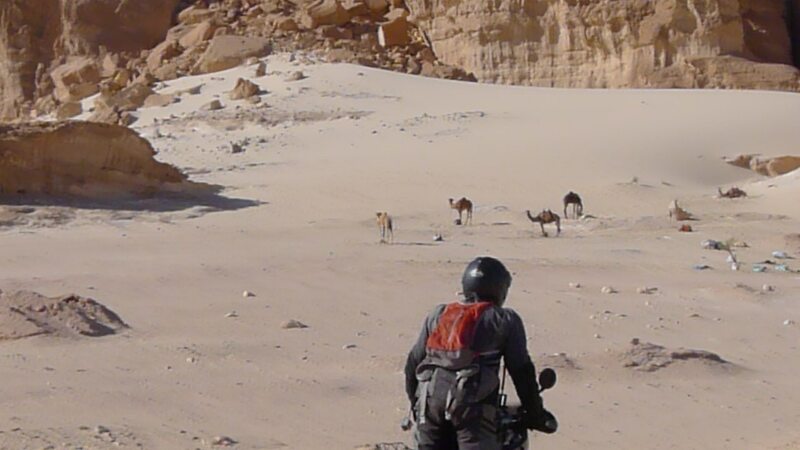 Off roading in the desert… My bike in the distance dodging the litter. 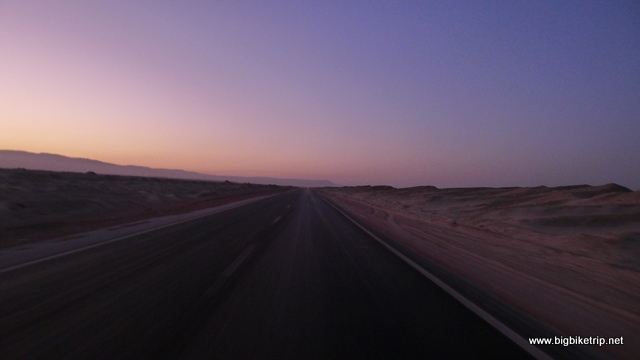 Anyway, we were back on the road again and heading north along the east coast of mainland Egypt … the Red Sea on our right and the rose coloured rocky mountains on our left. The scenery would have been quite pleasant if it wasn’t for the numerous oil fields and the noxious smells coming from the refineries. Not very pleasant, but it does clear the sinuses. Egyptians, like the Chinese actually, have a habit of throwing their rubbish in the streets, by the side of the road or into rivers and canals and so any areas with populations nearby always had lots of human detritus everywhere which was a bit depressing to see. 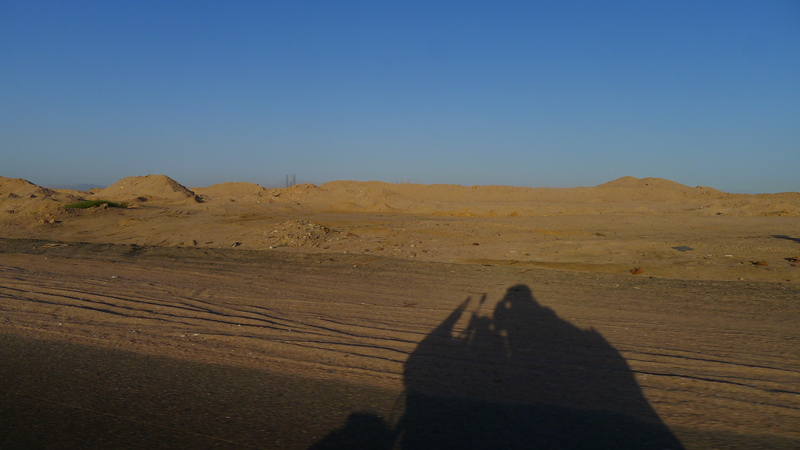 As I was riding along I reflected upon the fact that Egypt is actually a very lucky and privileged country. It sits on huge oil and gas reserves and has some of best tourist sites in the world. 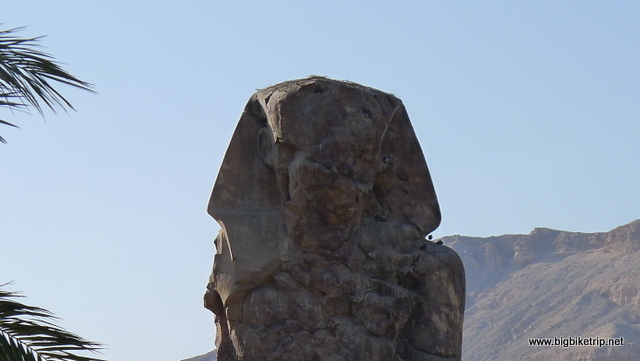 The beauty of the Red Sea and surrounding deserts is unmatched, and of course it has the legacy of Ancient Egyptian and the wonders and treasures it left behind.The Suez canal generates incredible revenues due to the huge commercial shipping traffic that uses it as a short cut between Europe to Asia. 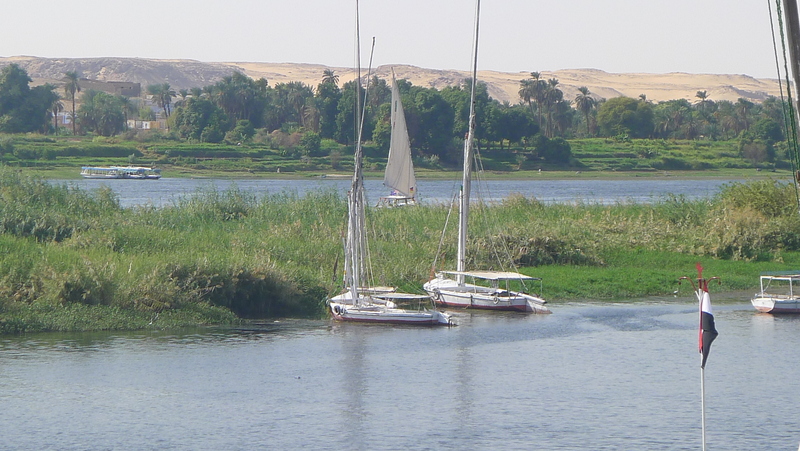 Whats more, and probably not appreciated by many people in the world, the Nile Delta is one of the most fertile and productive agricultural regions in the world. I really hope following the over throw of the Mubarak regime that it remains accessible to people like us, secular and tolerant… unlike some of its middle east neighbours. As we were heading north along the coast of the Red Sea we thought we would stop in El Gouna, www.elgouna.com a new development aimed at the well healed who want every convenience and luxury right on their doorstep without having to leave the pool. To get there we left the main coastal highway and rode eastwards along a dry sandy track and then through some gaudy gates…. and then we saw it… brand new, soulless and expensive. Definitely not our cup of tea. It was one of those plastic resorts that the new moneyed adore and old money hates. Disneyland, the Stepford Wives and Discovery Bay (Hong Kong) all rolled into one. We had a drink at a bar that could have been anywhere in the world, looked at each other, shrugged our shoulders and both said in unison ‘Let’s get out of here’. 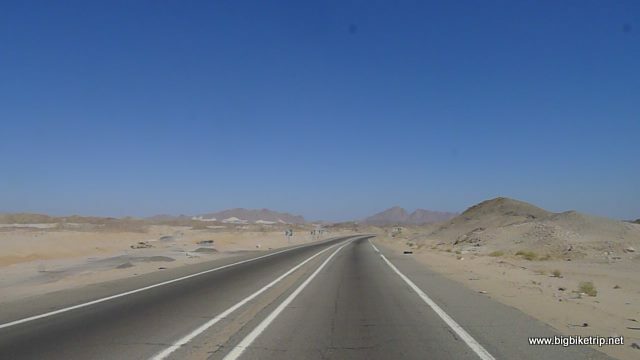 Because of the stop at El Gouna and because we had failed in several attempts to camp in the desert, having been chased away by soldiers and police, we had not made the progress we had hoped for that day. 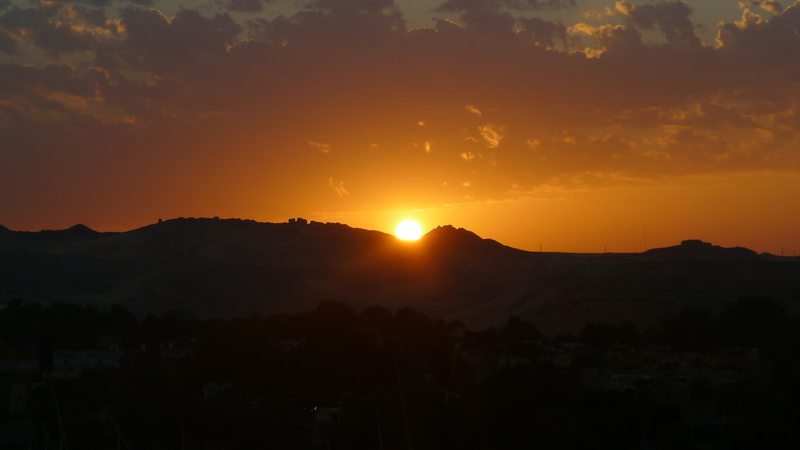 Just after it had got dark we arrived in a very small town called Ras Gharib and booked into the only hotel, right next to the petrol station. 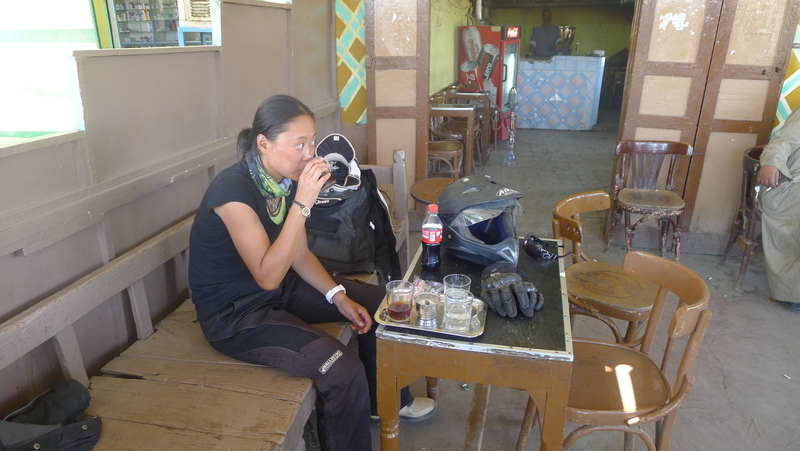 In every respect the perfect adventure biking resting place…. cheap, good food, a secure corridor inside the hotel to park our bikes, some interesting people to talk to and a petrol station outside selling 95 Octane fuel at 40 cents a gallon. 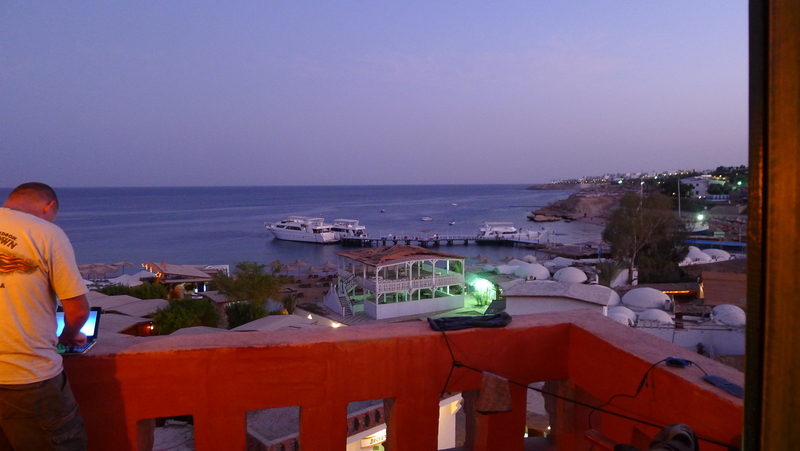 Later in the evening, whilst eating some excellent fish, we met the owner of the hotel, who, if he had been wearing a Fez, would have looked like one of those Egyptian police characters in a Peter Sellers movie. He was an interesting chap though and very well traveled with a home in Germany and several in Cairo and other parts of Egypt. 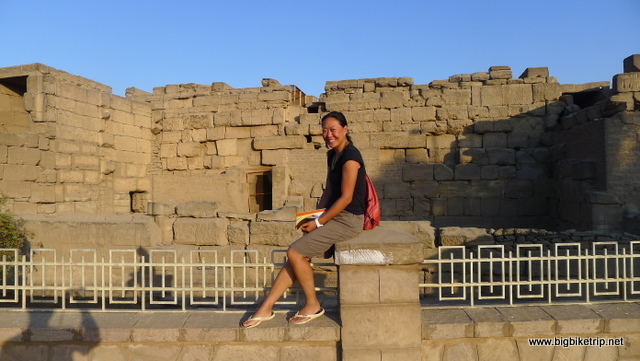 He was quite an entrepreneur and visionary and knew very well that Chinese tourists and businessmen were coming to Egypt in increasing numbers and so he had set up a small stall selling instant noodles. ‘I buy them for five pounds and sell them for eleven– good,eh? ‘Yes, they like noodles’, I replied ‘You’re going to be a rich man’. This endorsement of his cunning plan by two people from China really seemed to cheer him up. The next morning we continued our ride towards the tunnel under the Suez canal and after more army and police check points we were in the Sinai. For the first time in a while we were heading southwards with the sun setting to our right hand side. 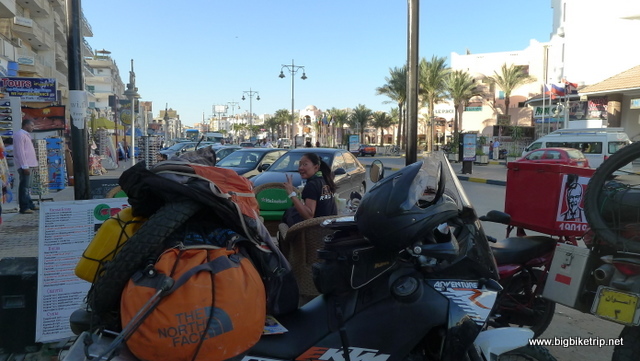 We got to Sharm El Sheikh in the late afternoon after some pretty fast and enjoyable riding along very good tar roads with only a short stop at an oil refinery town along the way for some falafels and bedouin tea. 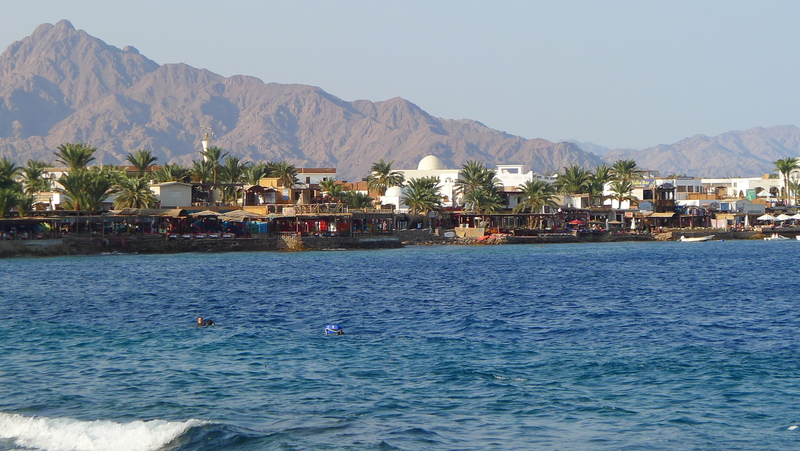 Sharm El Sheikh, at the most southerly tip of the Sinai peninsular, was a pretty impressive place with many high end hotels, luxury resorts and beautiful beaches. It was also one of the world’s greatest diving locations and after following the GPS coordinates for the town’s seemingly only camp site we arrived at Sharks Bay. Unfortunately the GPS information was four years out of day and the area had been developed into a resort. 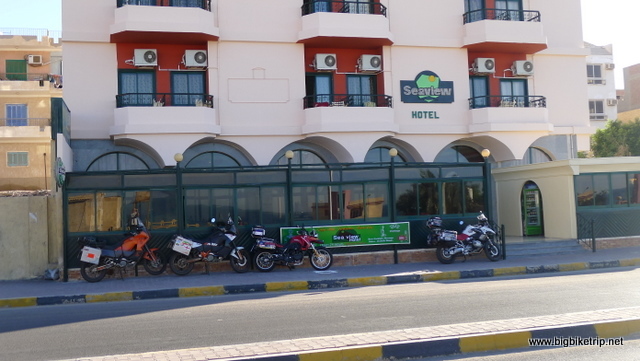 It appeared that there were no camp sites any more in Sharm and as it was late we checked into one of the rooms and stayed for three days, mostly snorkeling and idling about. Wish I had something more interesting to report but that was basically it. A typical beach resort holiday. 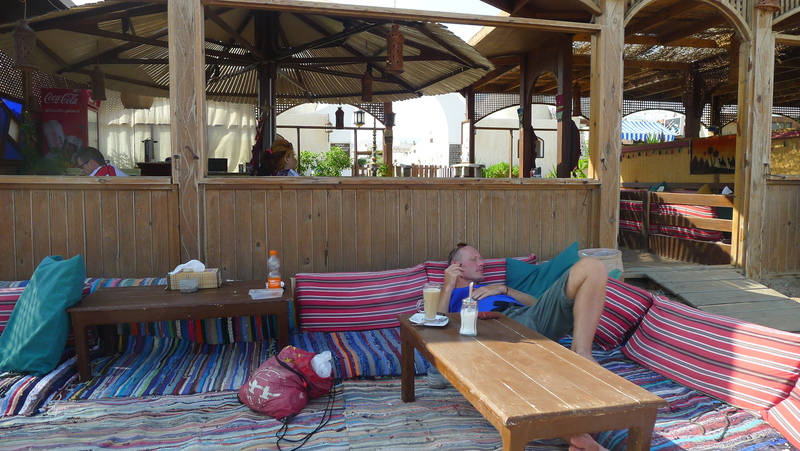 The room was nice, but we were both getting a bit bored and it was costing too much and so we rode about 70 kilometers north to Dahab and found a very peaceful and beautifully located former Bedouin fishing village, now one of the best diving and water sports locations in Egypt. 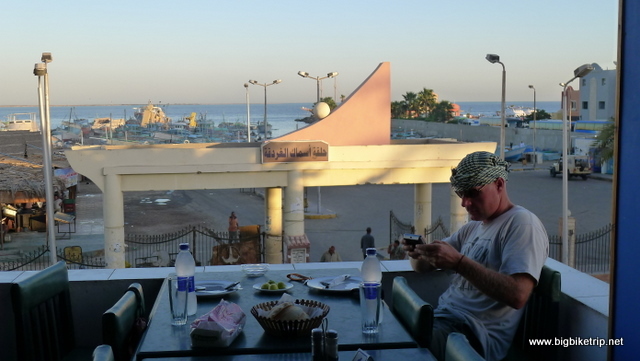 We checked into Ghazala http://ghazaladahab.com/ , a very laid back and pleasant beach side lodge and after a day of idling about started thinking where we should go next and how. 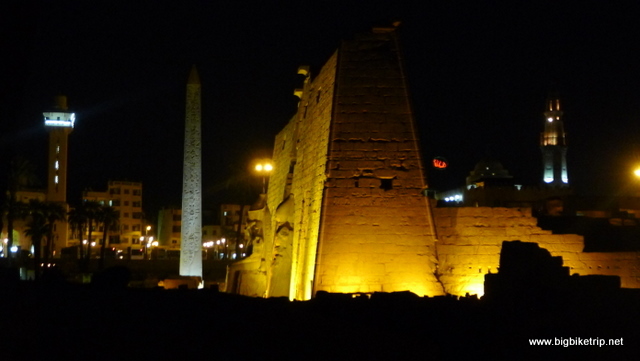 We have been exploring all sorts of options to get from Egypt to somewhere in Europe. 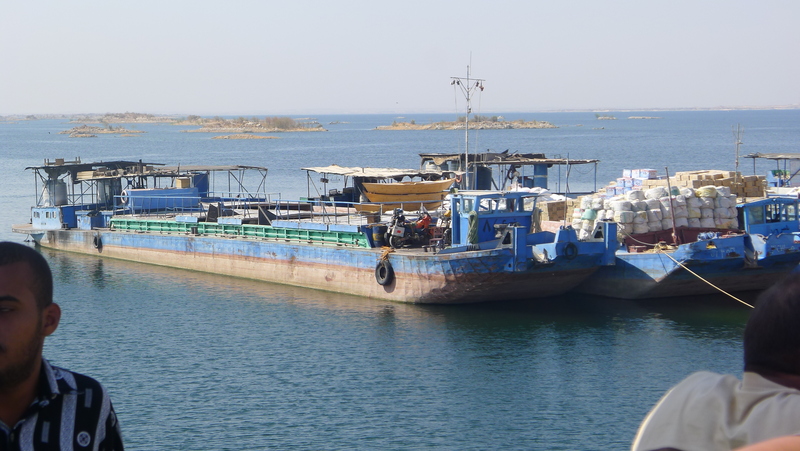 We were very nearly successful as the Chinese Ambassador to Egypt stepped in to help Fanny and arranged a COSCO cargo ship to take us from Port Said in Egypt to Piraeus port in Greece. 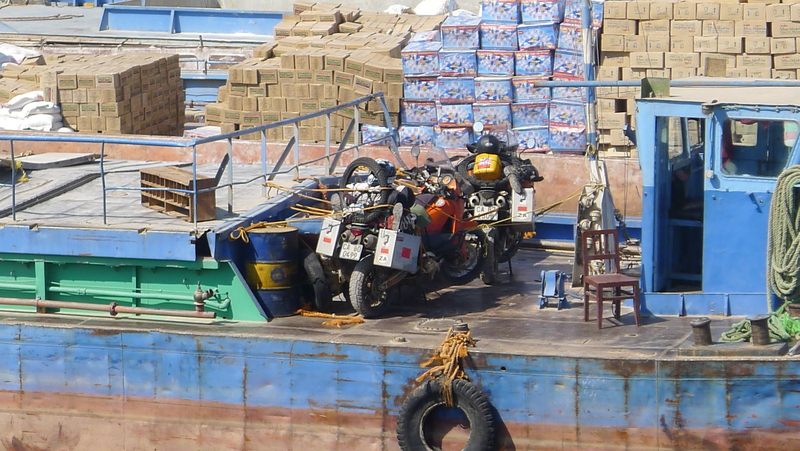 The arrangement needed approval from COSCO’s headquarters in Beijing and when we heard it had been granted we had to get to Port Said as soon as possible to prepare the paperwork and get the bikes loaded onto the ship. 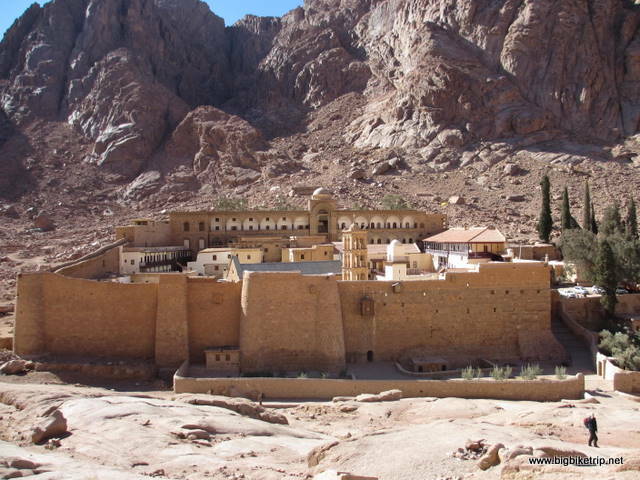 We decided that instead of taking the same highway back to the Suez Canal that we would ride across the desert and see Saint Catherine’s monastery on the way. 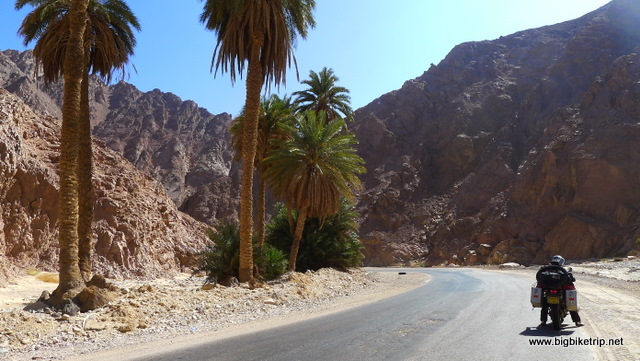 The road from Dahab to the monastery was motorcycling heaven. 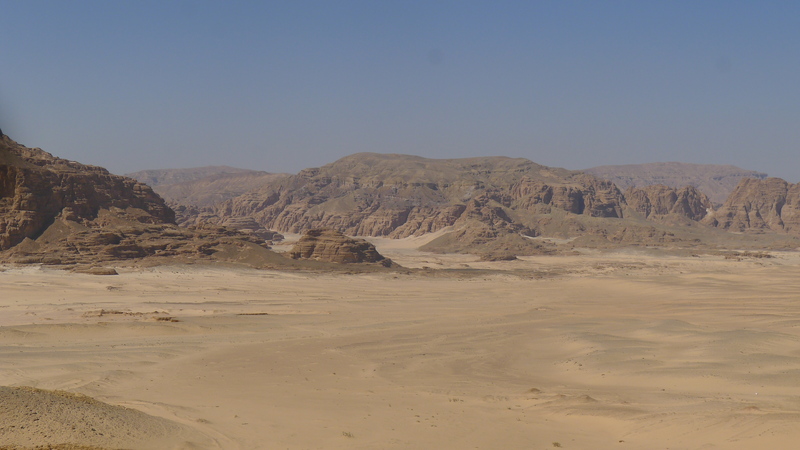 Long stretches of twisting and turning tar through desert mountains and valleys. Stunning colours, blue blue skies and a perfect temperature. Both Fanny and I were riding quite fast, but I had already changed my front tyre back to the M/T 90 Scorpion semi road one. Fanny on the other hand still had the knobbly M/T 21 rally cross tyre on her front wheel and so cornering at 180 kilometers per hour was not a good idea. I was thoroughly enjoying racing about and would blast ahead and scorch around the bends, accelerating out of the apex in the power band causing the wheel to rise up and then to over 200 kilometers per hour before finding the line through the next corner. Great fun, but at these speeds the 150 kilometers was covered in no time at all. 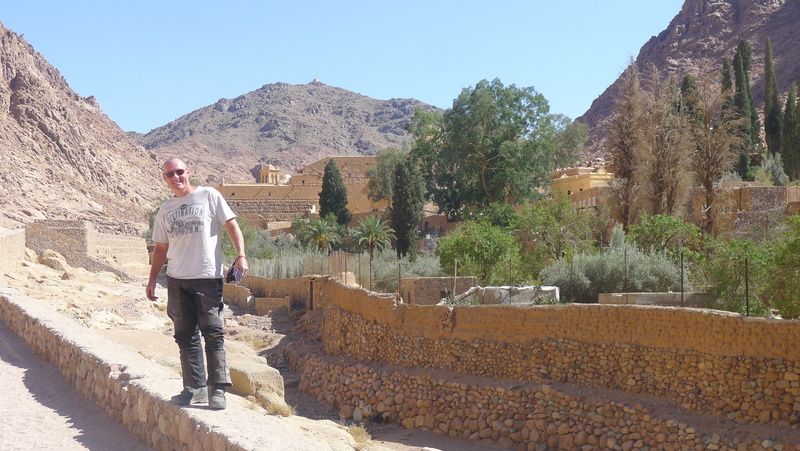 It might sound irresponsible to ride at such speeds, but there is always a time and place for everything, and if I am going to meet my maker, then the oldest working monastery in the world and where Moses received the Ten Commandments was probably a good place. Fanny was uninfluenced by my biker hooliganism, quite rightly she rode at whatever speed she thought was safe and appropriate for her regardless of what I did. Often I would take a break and wait for her to catch up and we would carry on. 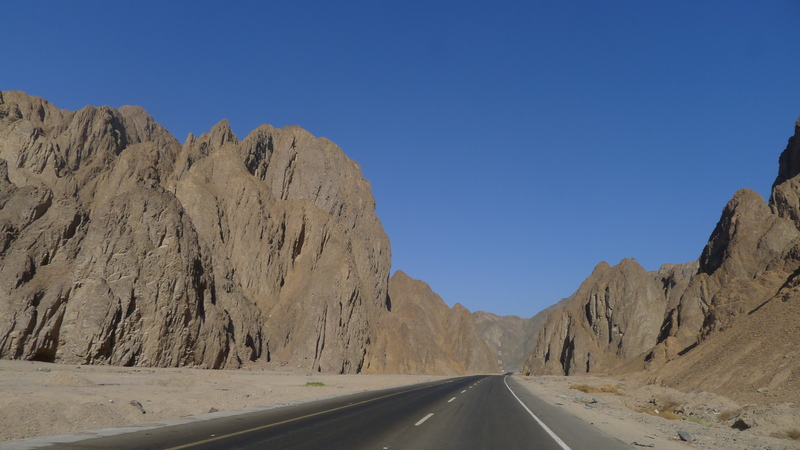 Both of us reduced speed considerably as we cruised into the spectacular valleys below Mount Sinai. Wow! 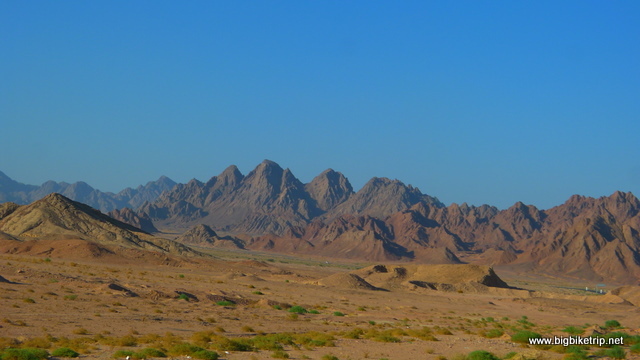 Mount Sinai is not the highest mountain in the range, but it is a truly special and spiritual place and one I remember learning about from about the age of six or seven. At this impressionable age, I was fortunate to attend The Holy Rosary Primary School in Burton Upon Trent, Staffordshire, right in the heart of England. It was here that Miss Hingorani, Mrs Nelson and their colleagues forged lasting memories about Greek mythology, the Holy Lands, ancient history, inventors and their inventions, and instilled in me the fascination for geography, travel and natural history that I maintain today. Now many years later Fanny and I had ridden all the way from our home in South Africa and were in the Holy lands staring up at Mount Sinai. Saint Catherines monastery was situated in the sort of location I would build a monastery if I was so inclined. I had been to Buddhist monasteries in Yunnan and Zhejiang in China and it seemed that beautiful, remote and peaceful locations is a common theme in the grand scheme of selecting a location for a monastery. Fanny and I explored the buildings, but on this occasion we did not see the icons inside because it was closed. 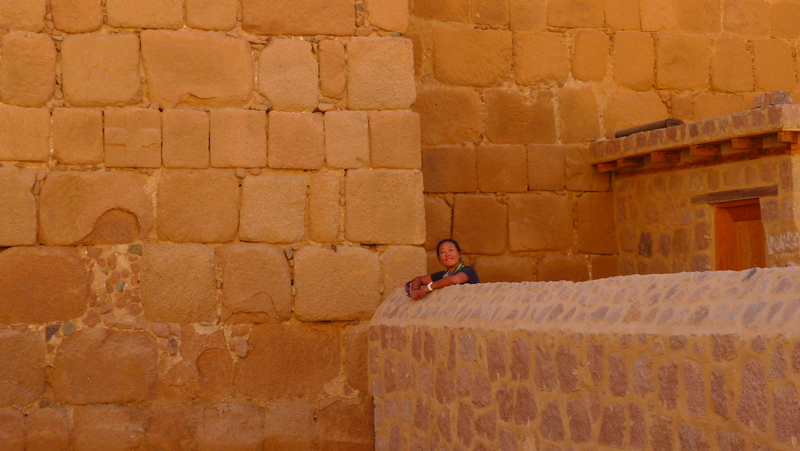 It has been a working monastery since 300 A.D so I guess a day off is taken occasionally. The monastery is named after the Christian martyr, Catherine of Alexandria who was tortured on a wheel and then beheaded. The Guy Fawkes, November the 5th “Catherine Wheel” firework is named after this grisly bit of human ingenuity. 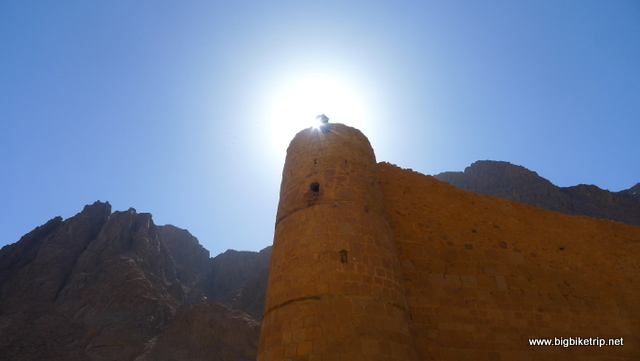 It is said her remains were taken by angels to Mount Sinai and later found by the monks in the monastery below. 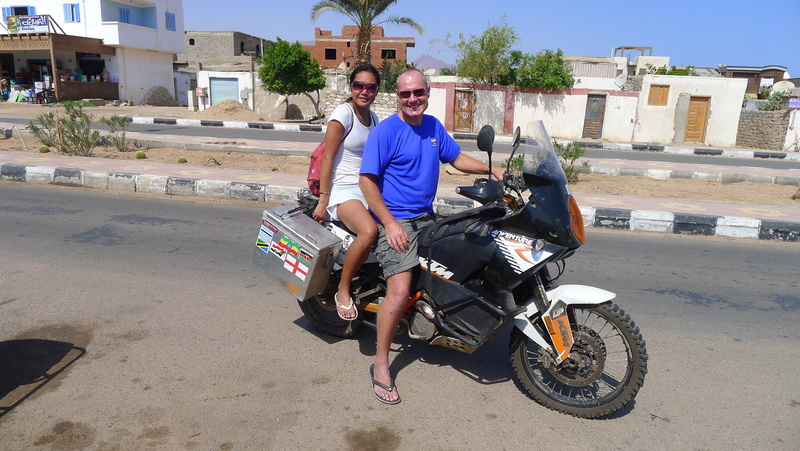 Fanny and I riding around Dahab.. Nobody wore helmets in Egypt and neither did we as we pottered about on the bikes in shorts and swimming gear … armed with snorkeling kit. If we went off road riding in the dunes or if we went for a longer ride we would get the protective gear on again. 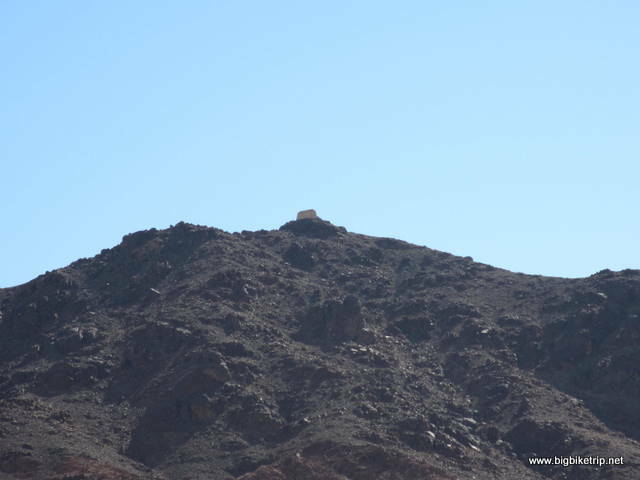 Dahab.. our home for four months…. 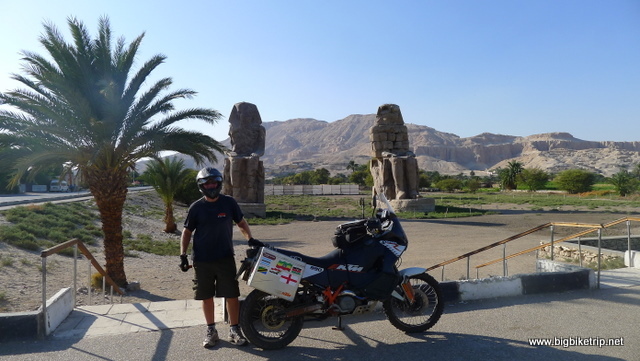 Since we had to be in Port Said early the next day we had to press on and so we rode across the Sinai desert, passing through oasis villages lined with palm trees. 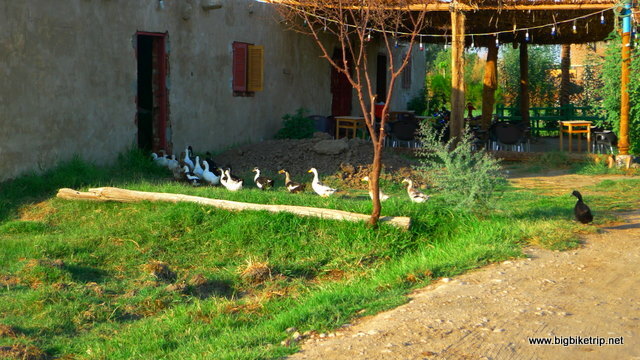 One oasis that we sped through was called Ferrari, a good name for a village to race through. As we neared the coast we suddenly rode into a sand storm which was quite a scary experience on a motorcycle and a bit claustrophobic. Due to the strong winds, the bikes were riding at a considerable lean and sand was blowing through the cracks in my visors and into my eyes and mouth. I was worried it was getting into the engine air filters and we had no alternative but to slow down considerably. 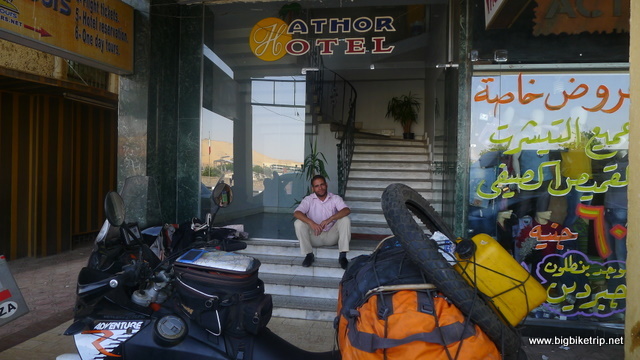 I realized we would not make a further 200 kilometers to Port Said and so we stopped at a small town and booked into the first hotel we saw. ‘How much you want to pay’, he quickly said as we were turning around. 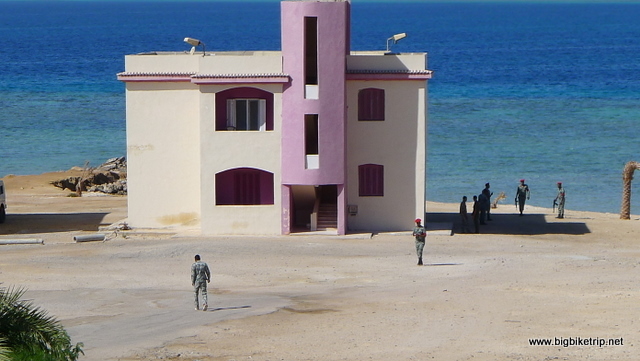 The manager made a sort of disapproving snort, but we made an agreement and I was handed the keys to a pretty decent room overlooking the beach and Red Sea. As I was filling out the registration forms in the reception I suddenly realized we were the only guests in a hotel that had a potential capacity of over a hundred. The sun had gone down and the manager, the only person we saw, disappeared after taking our cash and photocopying our passports and I suddenly thought of the hotel in the movie,The Shining. It was slightly spooky to be the only people in a fairly sizable hotel. Joking to Fanny that there was not a scary maze outside did not calm her nerves. About an hour later Fanny received a call from Mr. Xu from COSCO shipping company in Port Said stating that the Greek authorities in Piraeus were demanding a pointless and unnecessary “indemnity letter” from COSCO. Unfortunately, being a Chinese State Owned shipping company COSCO could not provide us with one as we were not their employees. They were just trying to help us, but the Greek authorities were being awkward and inflexible. Fanny had a Schengen visa for all EU countries for a year and as I am British I held an EU passport which Greece was still a member of at the time. We had Carne de Passages for both motorcycles ( which were not required for Greece anyway), we had European motorcycle insurance, and we were riding Austrian motorcycles that adhered to the strictest EU emission controls. If we were to arrive at a Greek road border on our bikes there would be no issue and so we were confused why this demand was being made and annoyed the well intentioned plans of the Chinese authorities to help us had been scuppered. Mr Xu was sorry, but he said we would not be able board the ship and so we were back to square one as Syria was in the early stages of a civil war and was no longer issuing visas. In any case Fanny is Chinese and China were supporting the Assad regime and I am English and the British were supporting the rebels. Between the two of us we would no doubt upset everyone in Syria. We could not go east either as Fanny, being a woman of course, was not allowed to ride a motorcycle in Saudi Arabia, and we could not go west as Libya was in the throes of armed rebellion. 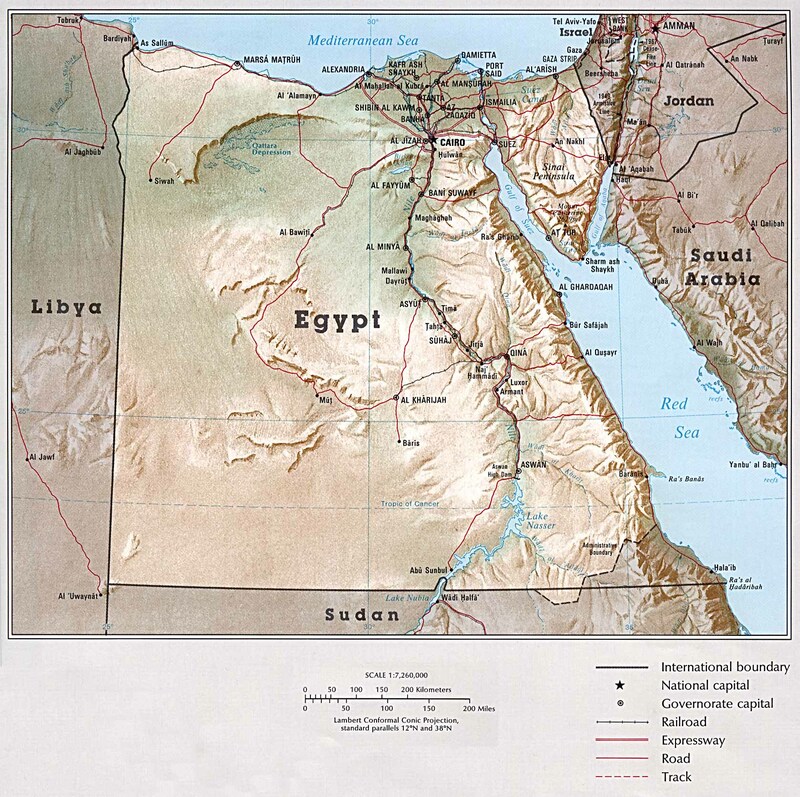 Egypt – Part. 2 to follow….. This entry was posted in Africa, Route, Uncategorized, Visas. 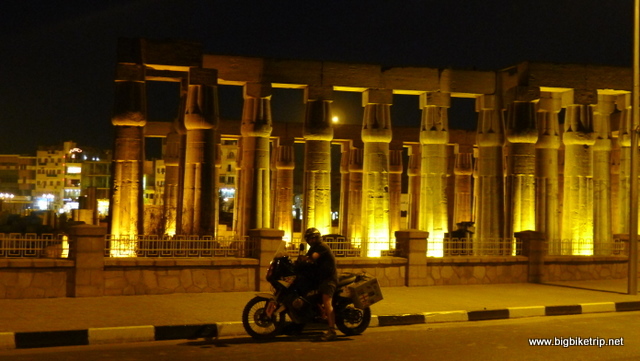 Tagged 990 Adventure, Al Harghada, Alexandria, Aswan, Bedouin, Cairo, camel, Dahab, Egypt, falafel, ferry, ful, Hugharda, KTM, Libya, Luxor, Mohammed, Moses, mosque, motorcycles, Mount Sinai, Mubarak, Nile, Nubian desert, Padi diving, Peugeot, Pharaoh, Pirelli, Port said, Red Sea, Sahara, scuba diving, Sharm El Sheihk, Sinai, snorkeling, St Catherines, Syria, tea, Ten Commandments, Valley of the Kings, Wadi Halfa. You, a mad. scary. bugger?…why it fits as tightly as a glove. So glad you are posting again but hurry it along would you ~ snort. Don’t mention the Bribery Act! OK if Fanny paid it? She is not a UK citizen.